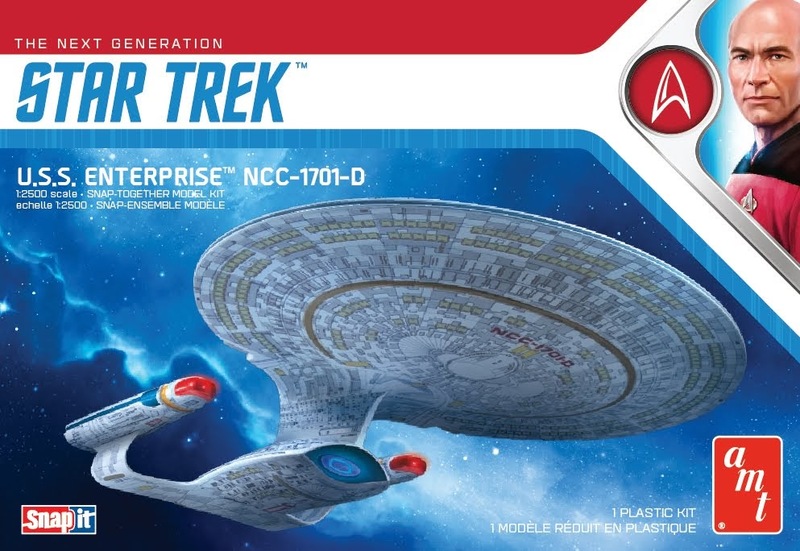 The page lists Star Trek publications and releases in 2019, including all prose fiction, comic books, non-fiction, and foreign language books, video games, music, video, toys, board games, and other collectables and curiosities. For other years, see my schedules and guides index page, and for reading lists, product lists, and other lists by subject, see my lists site. 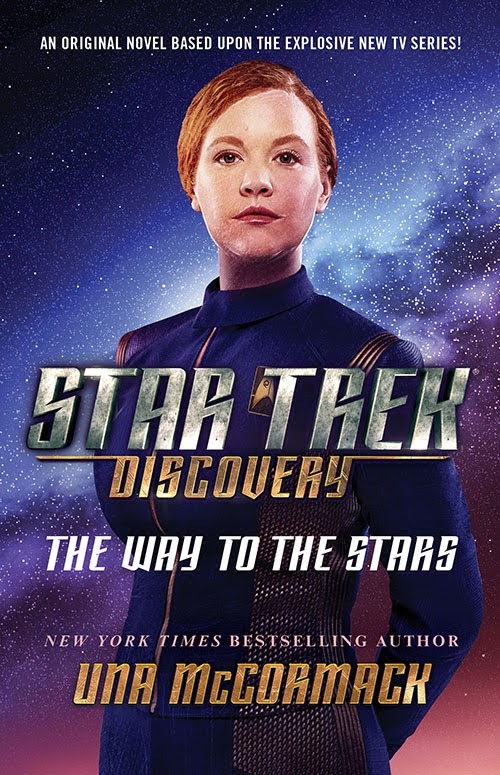 Series/format: Discovery novel. Trade paperback or ebook. Publisher: Simon and Schuster (print, ebook, and audio download) and Blackstone Audio (CD). 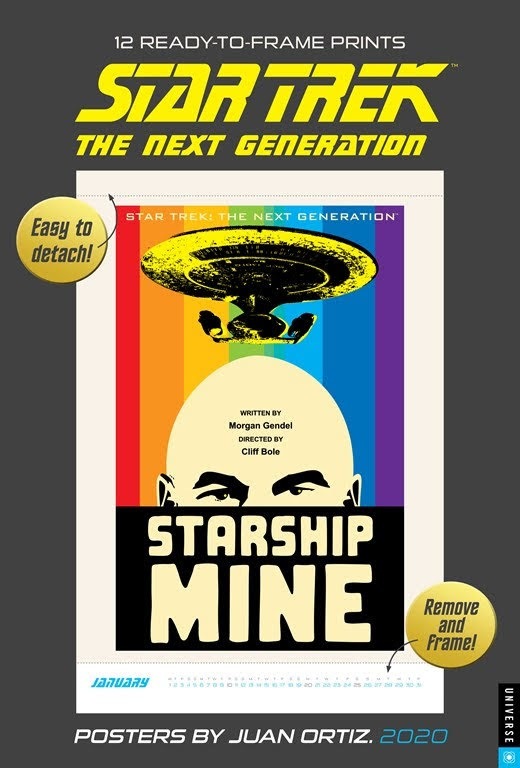 Coverage: Cover and blurb, audiobook confirmed, excerpts. 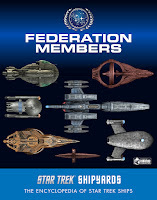 Paperback: Amazon, Barnes and Noble, Forbidden Planet. 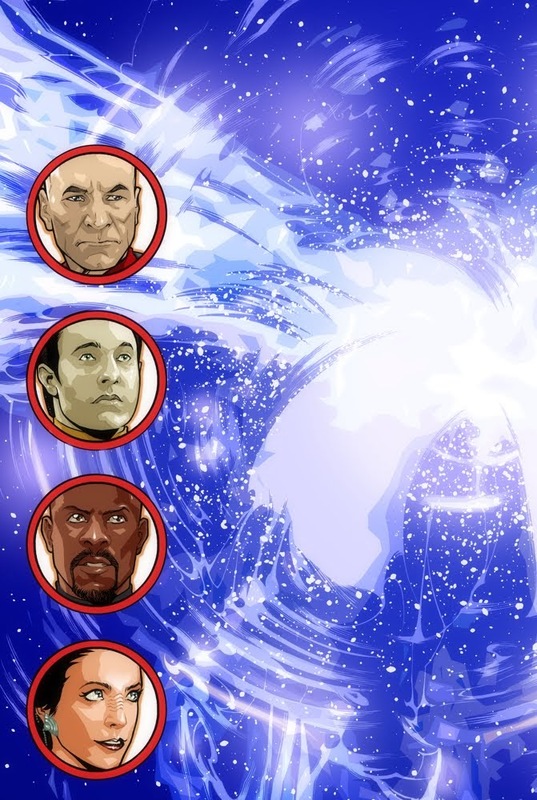 Series/format: Final issue in a mirror universe TNG comic miniseries. Writer: Scott and David Tipton. Artist: Carlos Nieto. Coverage: Solicitation covers and blurb, covers and excerpt. Paperback: Things From Another World, Forbidden Planet. 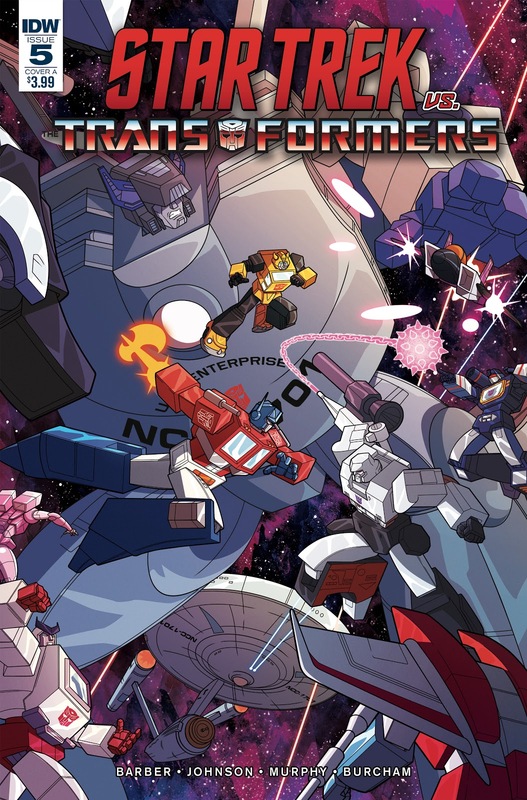 Series/format: Fourth issue in a TAS/Transformers crossover comic miniseries. Writer: John Barber and Mike Johnson. Artist: Philip Murphy. 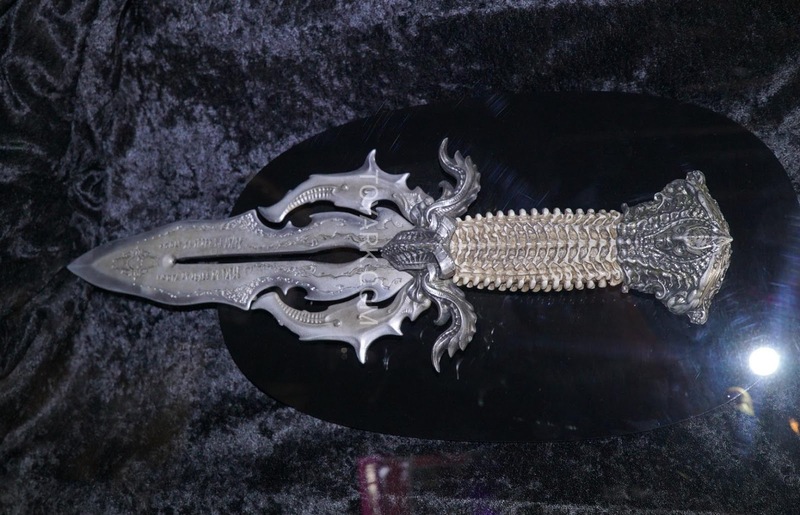 Paperback: Amazon, Things From Another World, Forbidden Planet. 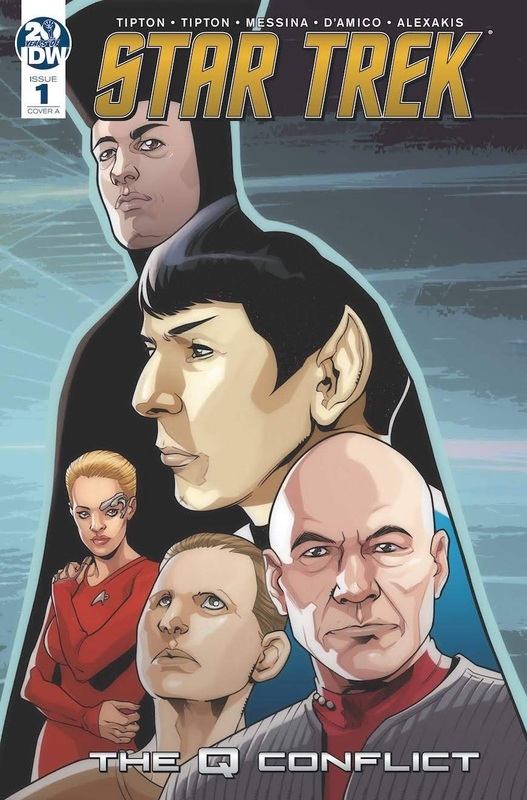 Series/format: First issue of a TOS, TNG, DS9, and Voyager crossover comic featuring Q. Writers: Scott and David Tipton. Artist: David Messina. 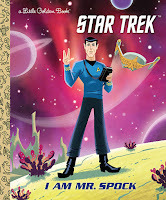 Coverage: First hint, announcement, solicitation, cover art, covers, covers and excerpt. eBook: Amazon, Barnes and Noble, iTunes. 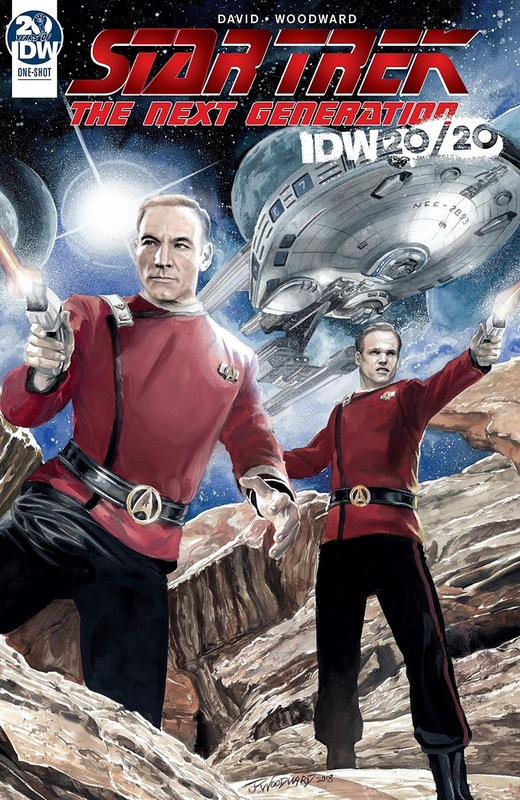 Series/format: Stargazer-era TNG comic, part of IDW's 20th anniversary 20/20 event. Writer: Peter David. Artist: J.K. Woodward. Coverage: First hint, announcement, solicitation, art previews and process videos, cover, covers and excerpt. Series/format: Omnibus of the TOS photo-comic series, containing issues #21-22 and the special adaptation of The Cage. Coverage: Cover and blurb, solicitation cover and blurb, bonus story. 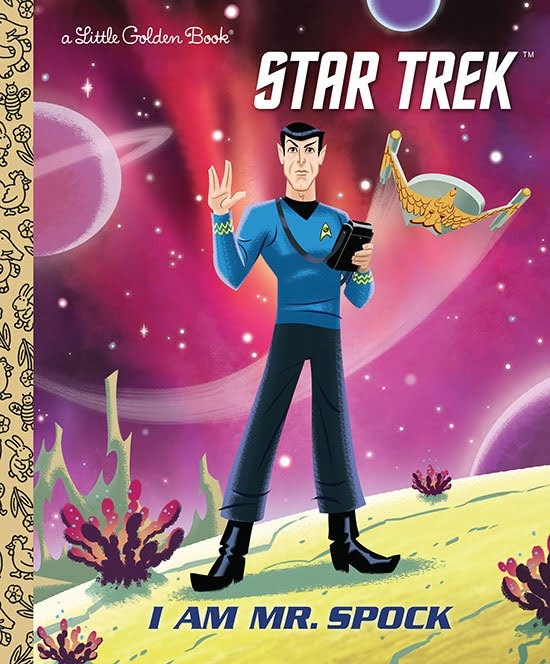 Series/format: TOS children's book in the long running Little Golden Book series. Author: Frank Berrios. Artist: Ethen Beavers. Coverage: Cover and blurb, excerpt. Author: Elizabeth Schaefer,. Artist: Ethen Beavers. 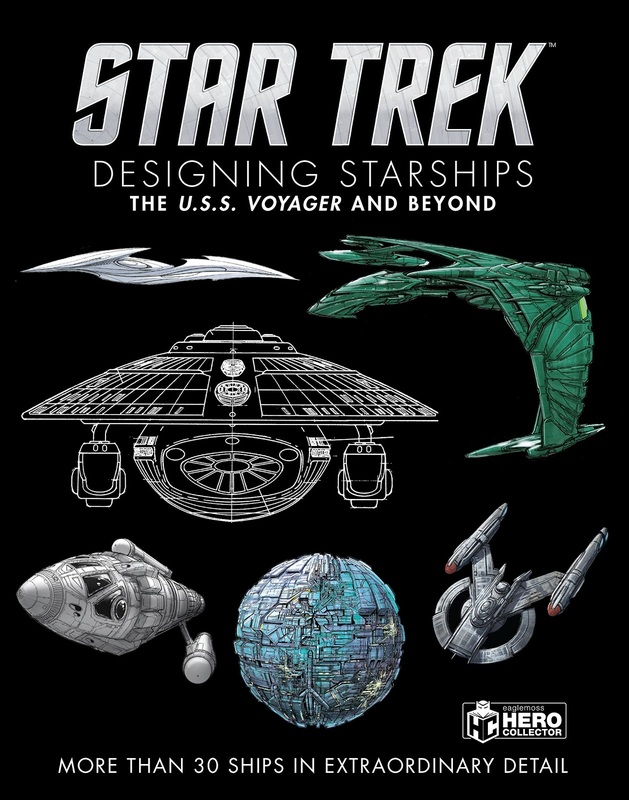 Series/format: All series behind the scenes starships design reference book. 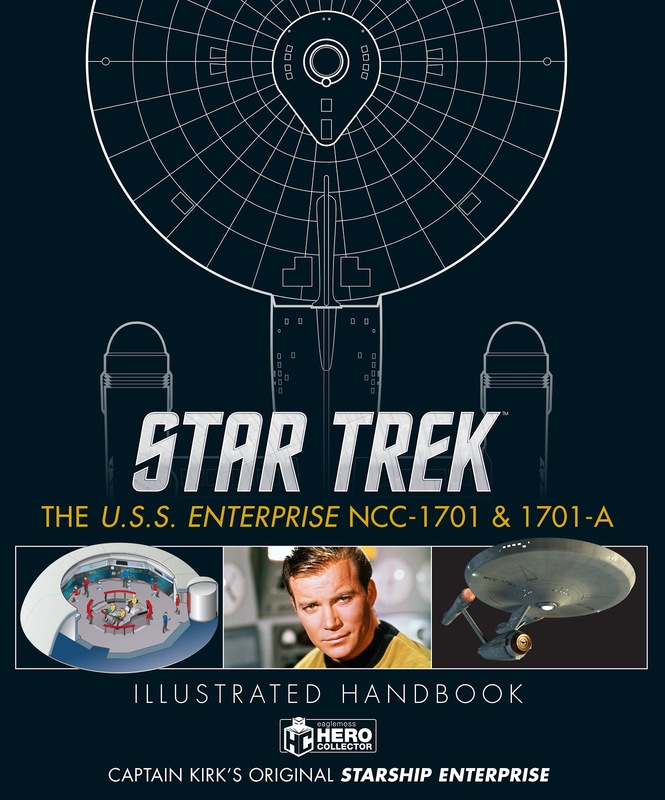 Hardcover reissue of the book first published in 2017, with new cover art. Author: Ben Robinson and Marcus Riley. Series/format: First episode of the second season of the TV series Discovery. Writer: TBA. 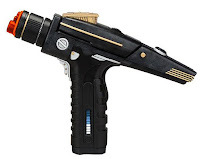 Director: Alex Kurtzman. 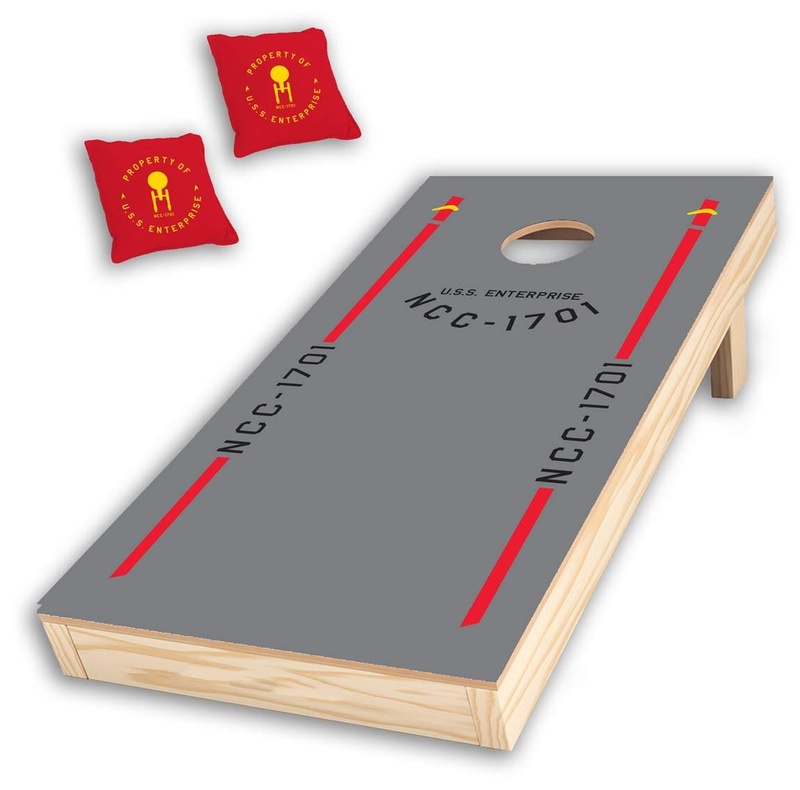 Production companies: CBS Television Studios, Secret Hideout, and Roddenberry Entertainment. 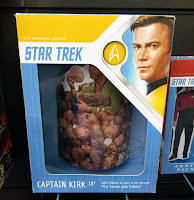 Coverage: Season two renewal, hint at the season's theme, more hints at season's themes and characters, Captain Pike casting, director, and number of episodes, behind the scenes video, Pike haircut video, showrunner change, and character detail, first stills, trailer and stills. 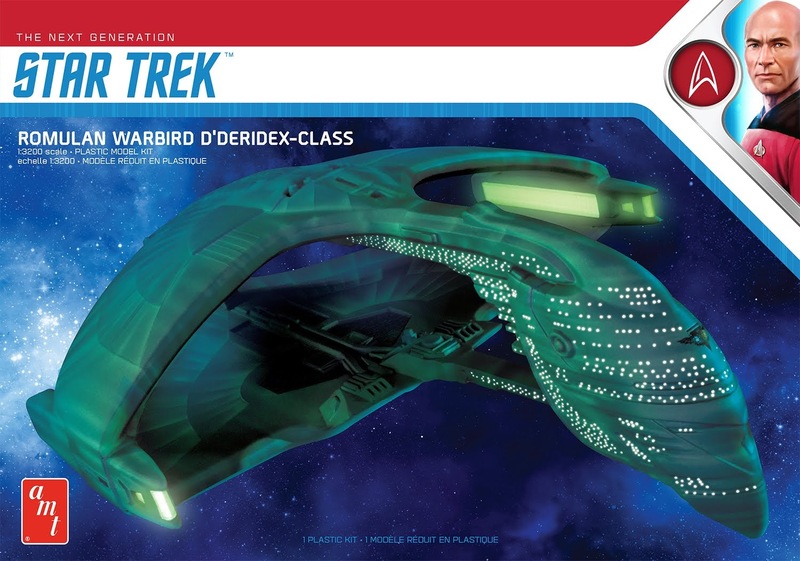 Series/format: TNG issue in the starship model and magazine series. 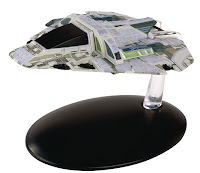 Coverage: Model photos, cover, and rendering, model photos. 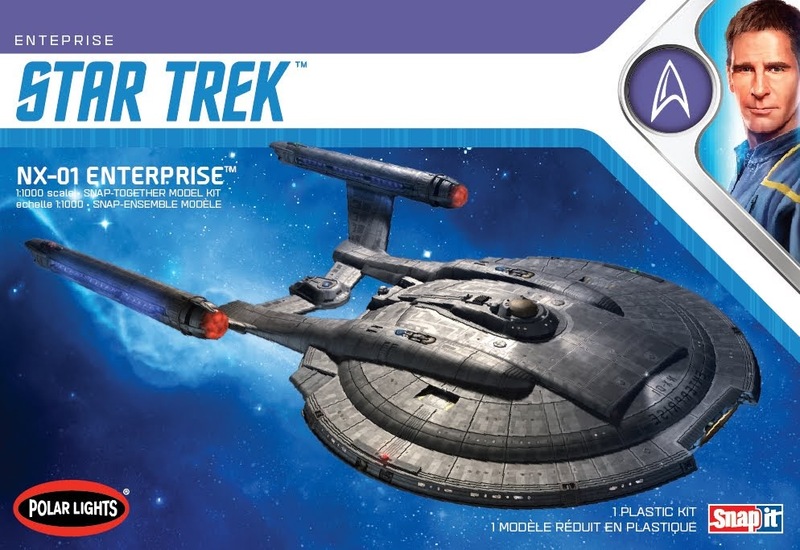 Series/format: TNG issue in the starship model and magazine series, model photo. 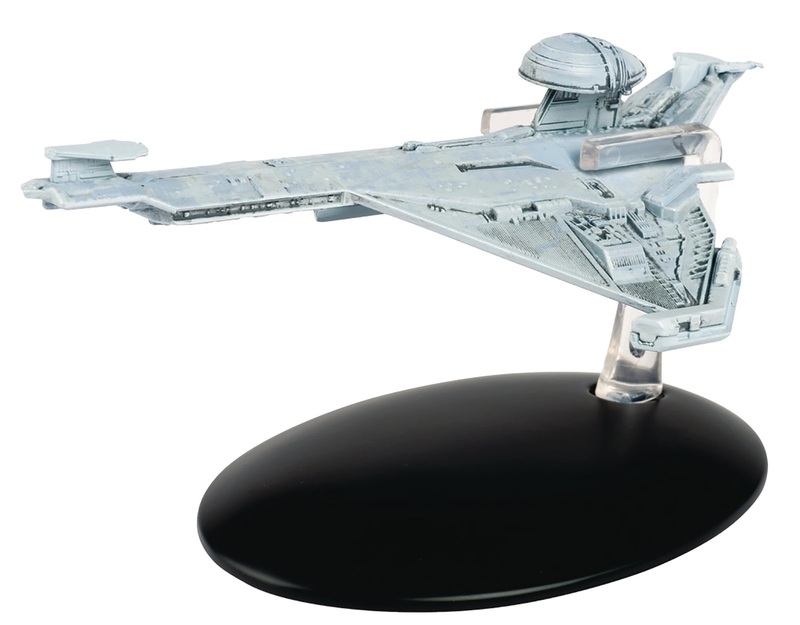 Coverage: Model photos, cover, and rendering. 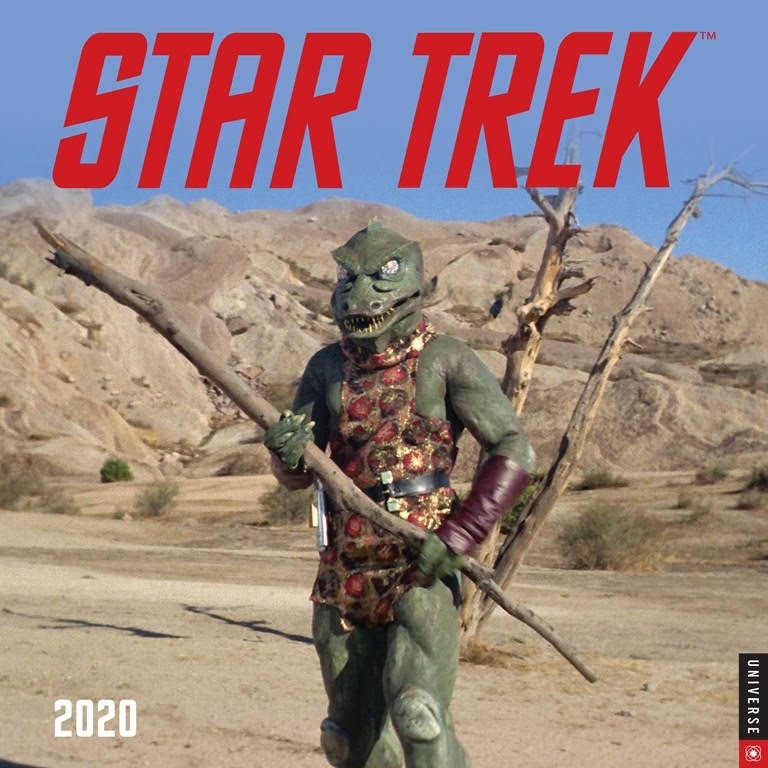 Series/format: TOS issue in the starship model and magazine series. Coverage: Model photos, cover, and rendering, model photo. Series/format: TOS-era starship model and magazine bonus issue from the ongoing series. 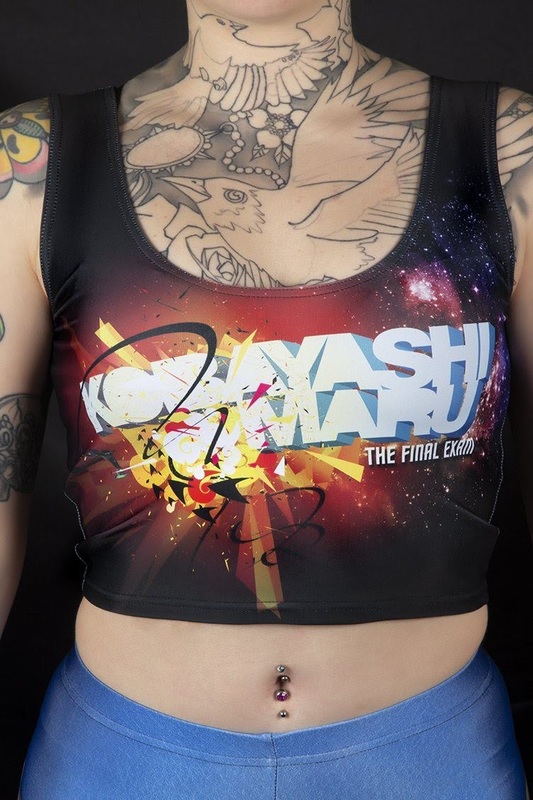 Coverage: Fan survey hint, announcement and rendering, model photos, cover and more model photos, more model photos, model photos and 360 video. 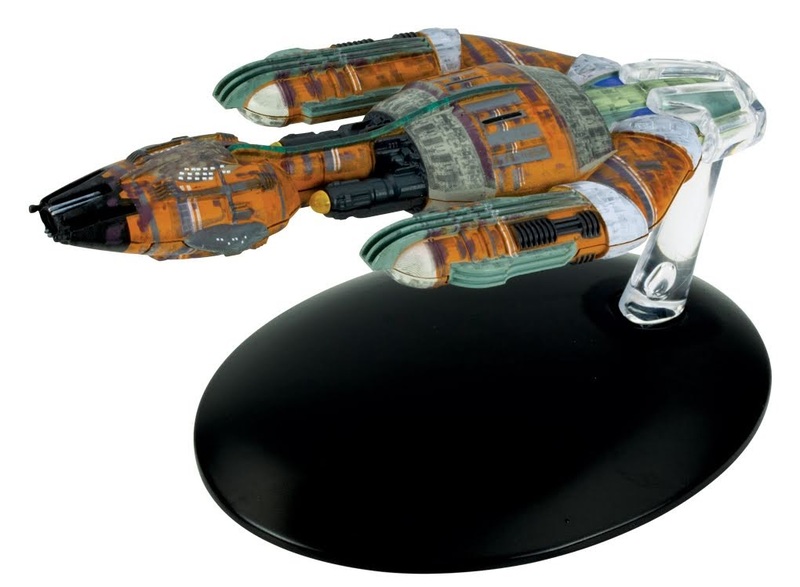 Series/format: Discovery starship model and magazine from the ongoing series. Coverage: Promotional poster image, issue number, model photos, cover and model photo, another model photo, more model photos, even more model photos, 360 video. 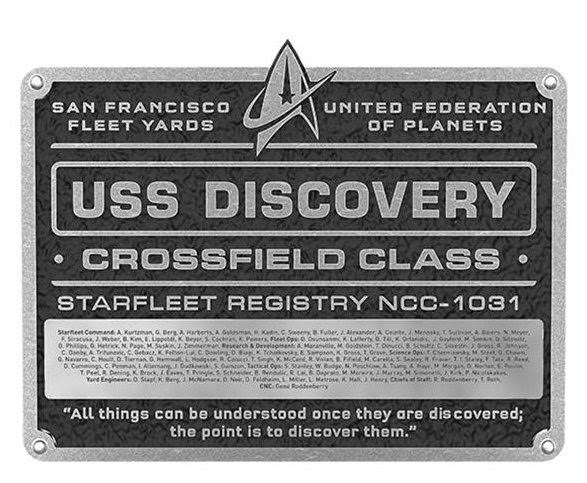 Series/format: Discovery dedication plaque from the ongoing series. 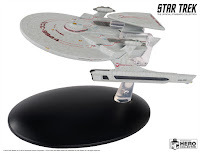 Series/format: First issue in a TNG model kit and magazine part work series. 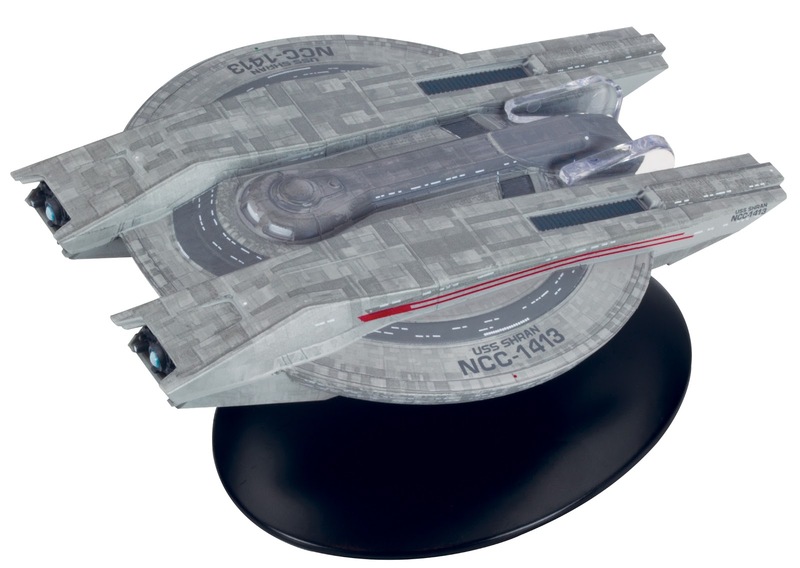 Series/format: 1:3200 scale TNG model kit. Re-issue in new packaging. 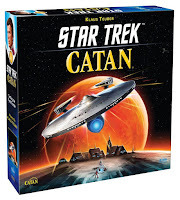 Series/format: Re-issue of the Star Trek (TOS movie era) edition of the board game Catan. 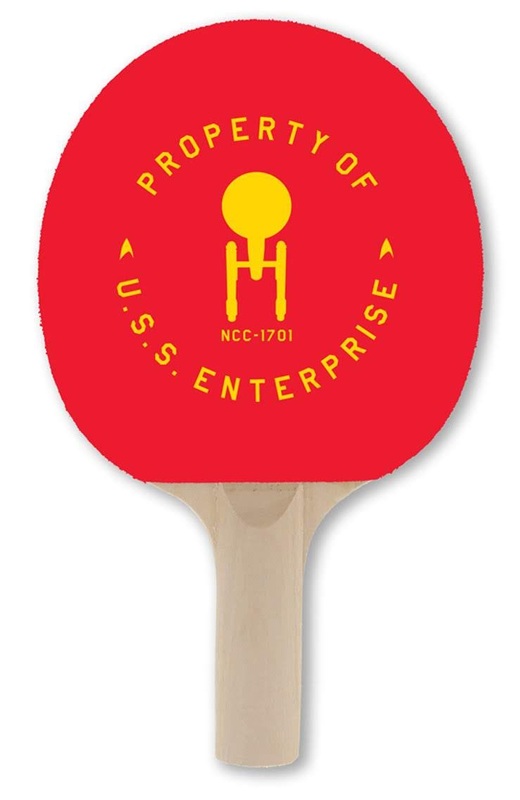 Series/format: TOS theme ping pong paddle. 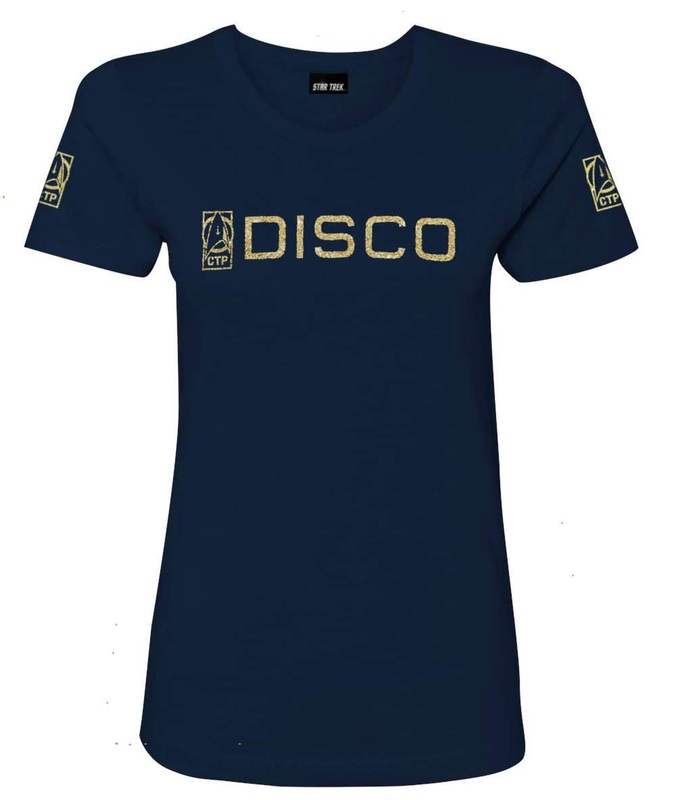 Series/format: Range of Discovery apparel featuring Command Training Program branding. Series/format: Range of Discovery apparel featuring Section 31 branding. 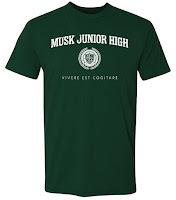 Series/format: Range of Discovery apparel featuring Musk Junior High branding. 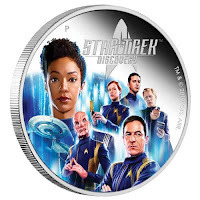 Series/format: Discovery coins, in the long running collection from Perth Mint. 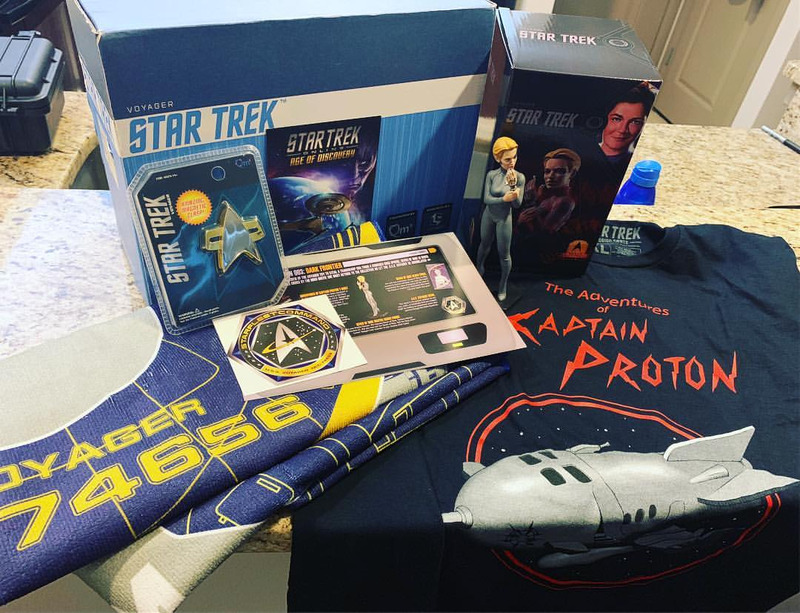 Series/format: Voyager themed subscription gift box in the Mission Crate series. Contains QMx Mini Master Seven of Nine figurine, a QMx Voyager insignia badge, a Captain Proton T-shirt, Seven of Nine towel, a Starfleet Command sticker, and Star Trek Online code. 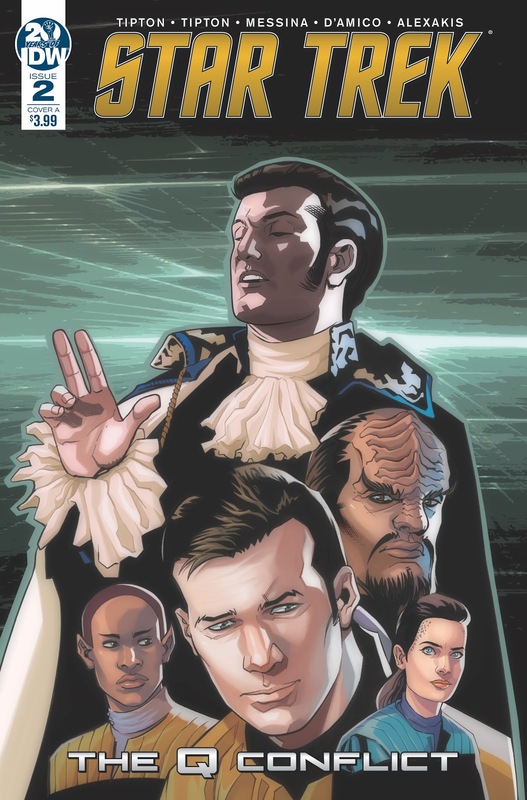 Series/format: Second issue of a TOS, TNG, DS9, and Voyager crossover comic featuring Q. Coverage: Solicitation cover and blurb, covers, covers and excerpt. 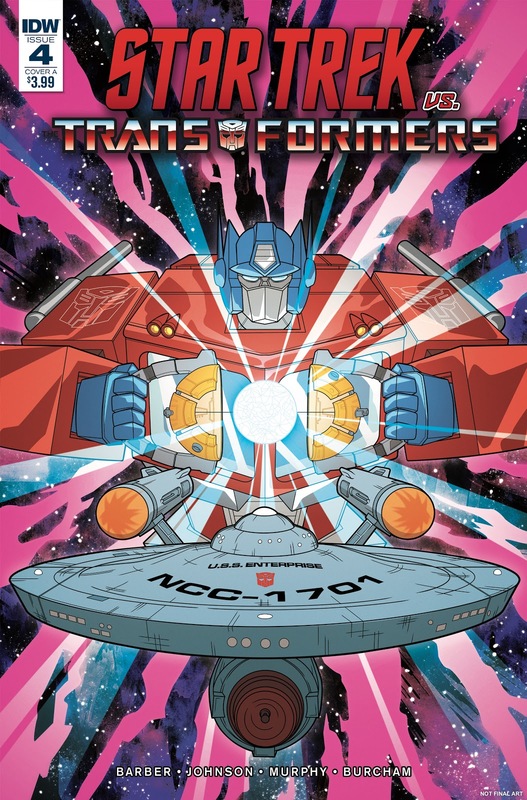 Series/format: Final issue in a TAS/Transformers crossover comic miniseries. Coverage: Solicitation covers and blurb, covers, covers and excerpt. Coverage: Model photos, and rendering, model photo and cover, model photos. 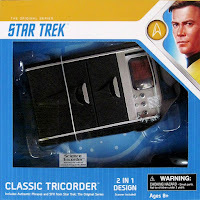 Series/format: Voyager issue in the starship model and magazine series. 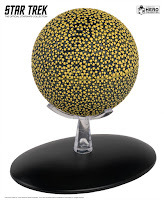 Coverage: Issue number, cover, rendering, model photos. Series/format: STO starship model and magazine bonus issue from the ongoing series. 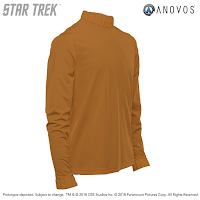 Coverage: Fan survey hint, announcement and rendering, model photos, more model photos, another model photo, model photos and 360 video. Coverage: STO variant model photos. 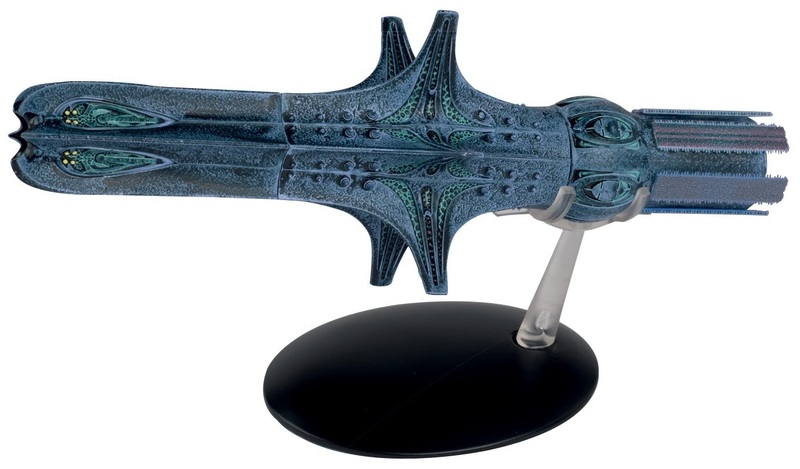 Series/format: TOS XL-sized starship model and magazine from the ongoing series. 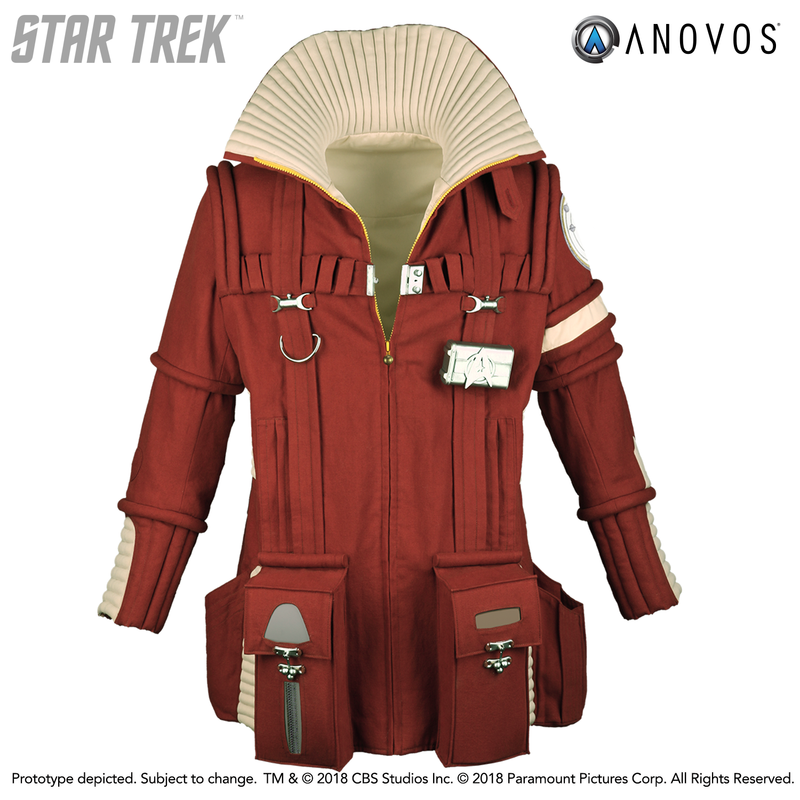 Coverage: Fan survey, confirmation, model photo, cover, higher res model photo and cover. Coverage: Rendering, promotional poster images, issue number, model photo and cover, more model photos, another model photo, 360 video. 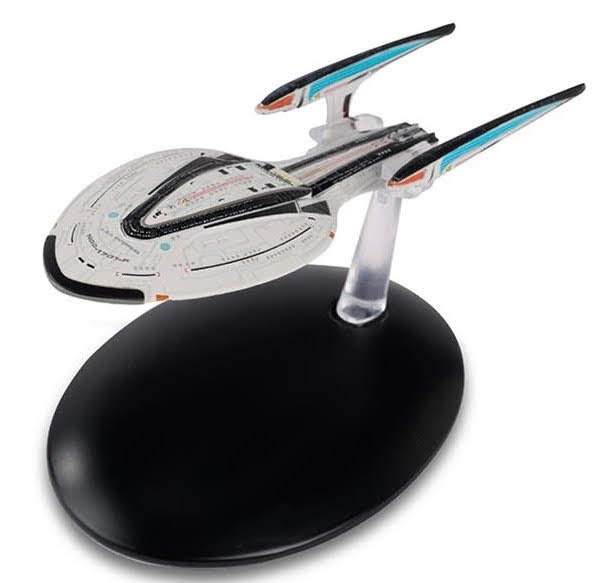 Series/format: Discovery figurine released in relation to the ongoing starships model series. 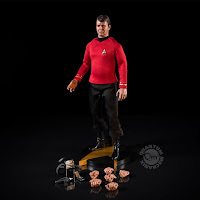 Series/format: 1/6 scale articulated TOS action figure. 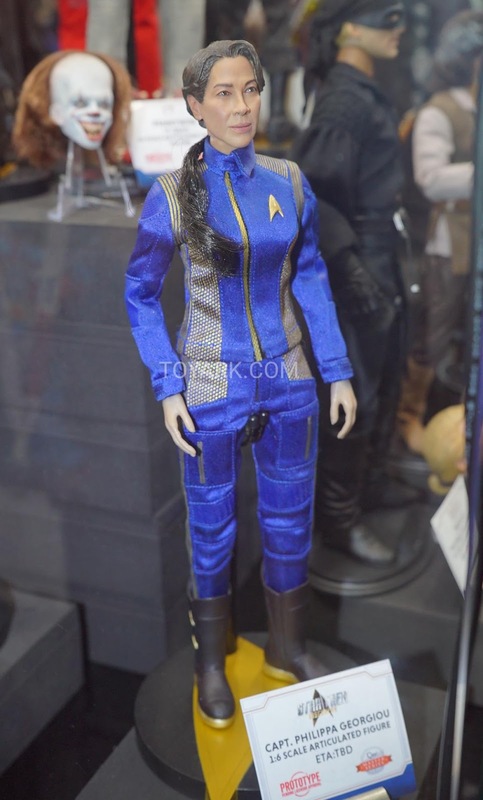 Coverage: Comic Con display, Toy Fair display, images. 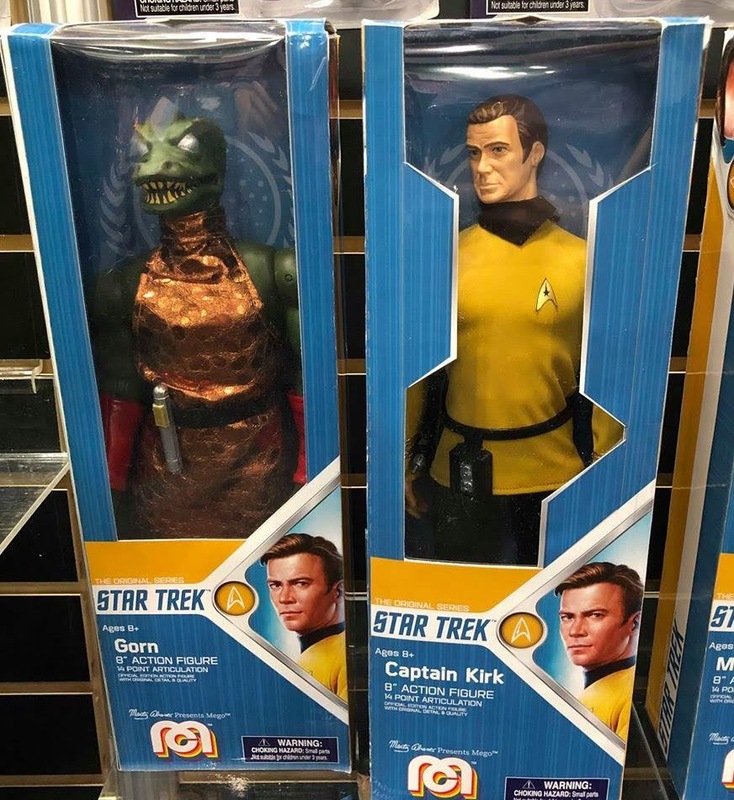 Series/format: Range of two Kelvin timeline action figures from the Star Trek Select range. 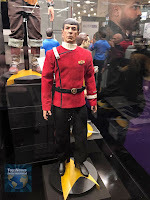 Coverage: Comic Con display, image and description, more images, packaging. 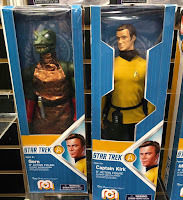 Set of two: Entertainment Earth, Things From Another World. Series/format: TOS toy prop with electronic sound and light features. Reissue in new packaging. 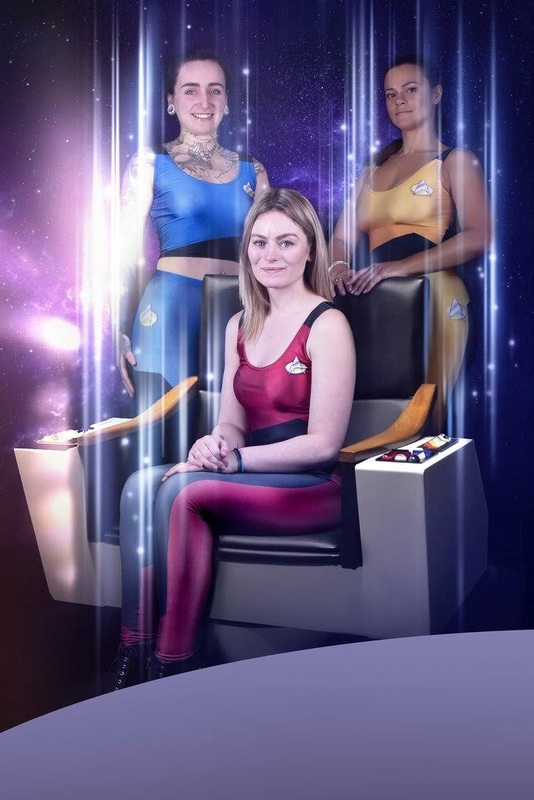 Series/format: TNG uniform styled crop tops and leggings. 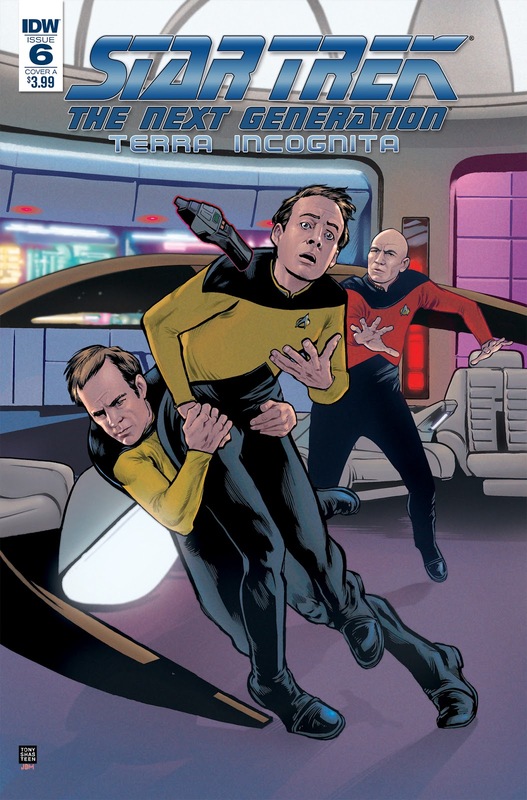 Series/format: Third issue of a TOS, TNG, DS9, and Voyager crossover comic featuring Q.
Series/format: Saru focused Discovery comic annual. Writers: Mike Johnson and Kirsten Beyer. Artist: Angel Hernandez. 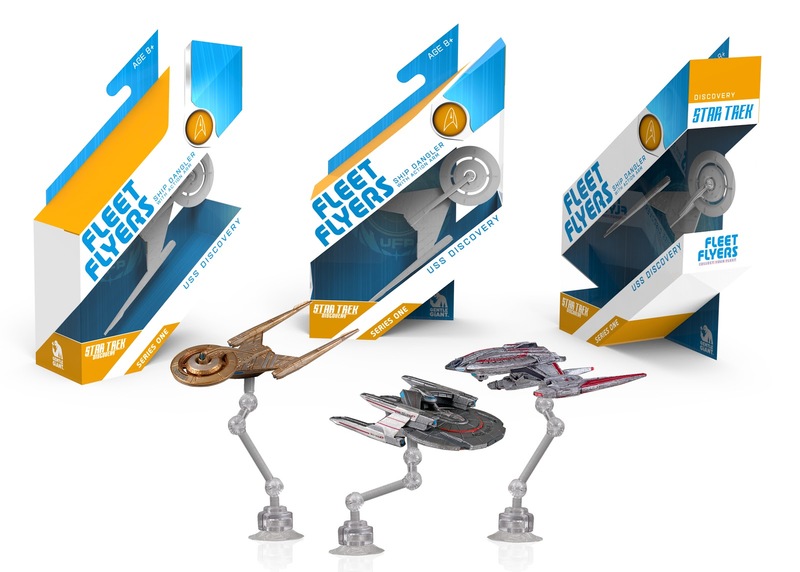 Coverage: Announcement, solicitation cover and blurb, retail incentive cover. 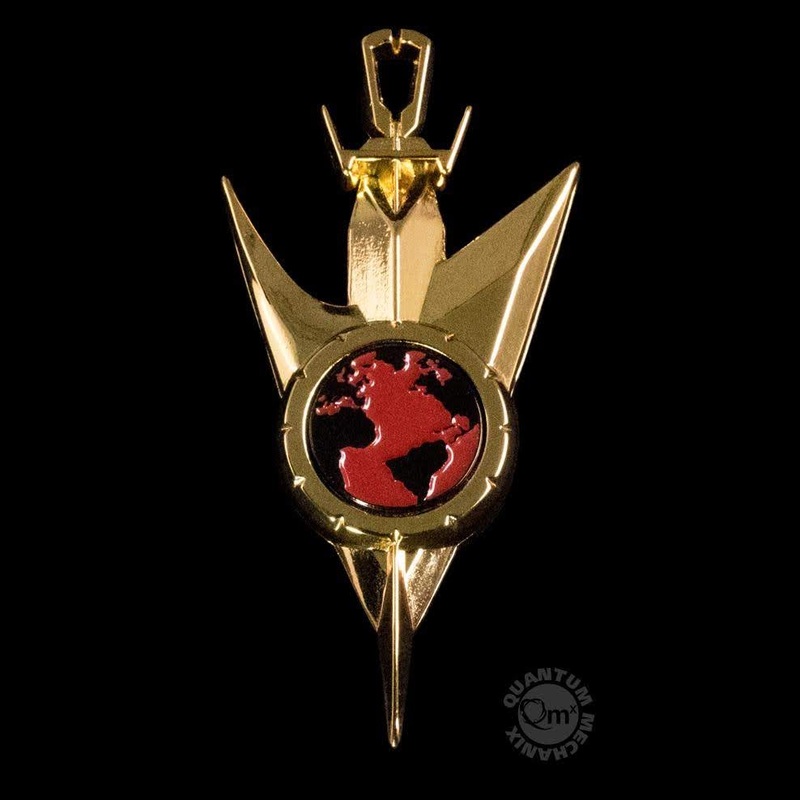 Purchase: Things From Another World. 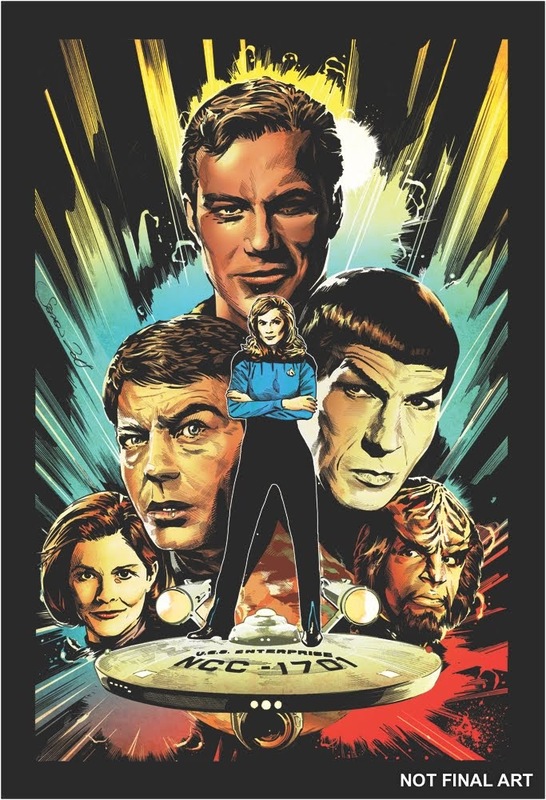 Series/format: TOS, TNG, and Voyager anthology comic special. Writers: Matt Sheean, Malachi Ward, Thom Zahler, Stephen Mooney, and Corinna Bechko. Artists: Malachi Ward, Stephen Mooney, Andy Price, and Daniel Irizarri. Coverage: Solicitation cover art and blurb, Daniel Irizarri art, Malachi Ward and Daniel Irizarri art, more Ward and Irizarri art, more Irizarri art. 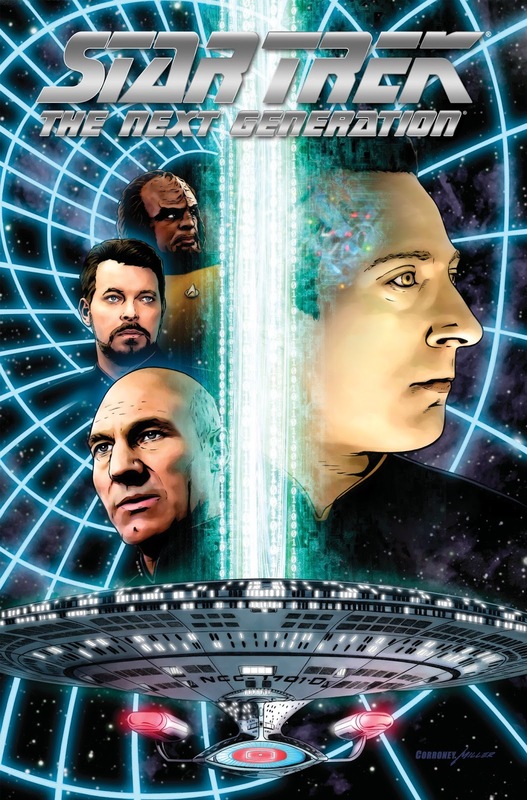 Series/format: TNG comic book omnibus, collecting five miniseries. Hardcover. 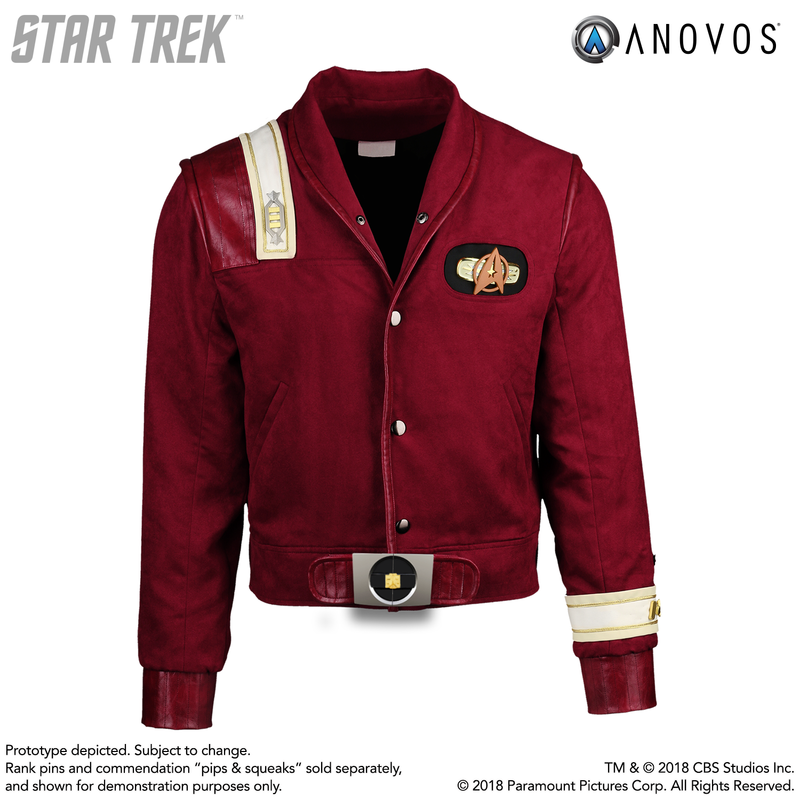 Writers: David Tischman, Scott and David Tipton, Andrew Steven Harris, Zander Cannon, Brannon Braga, Terry Matalas, and Travis Fickett. Artists: Casey Maloney, David Messina, Gordon Purcell, Javier Aranda, and Joe Corroney. Coverage: Cover and blurb, solicitation. Coverage: Model photo and cover, rendering, model photos. Series/format: TOS special-sized starship model and magazine from the ongoing series. Coverage: Confirmation, model photo and cover, higher res model photo and cover, model photos and magazine pages, another model photo, model photos and 360 video. Coverage: Manager confirmation, promotional poster images, model photos and cover, model photo and 360 video. 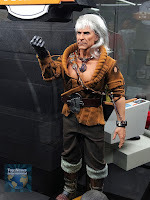 Purchase: Things From Another World, Forbidden Planet, Eaglemoss (US). Coverage: Manager size comments, promotional poster image, issue number and rendering, model photos and cover, model photos and 360 video. 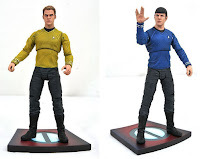 Series/format: TNG action figures from the Star Trek Select range. 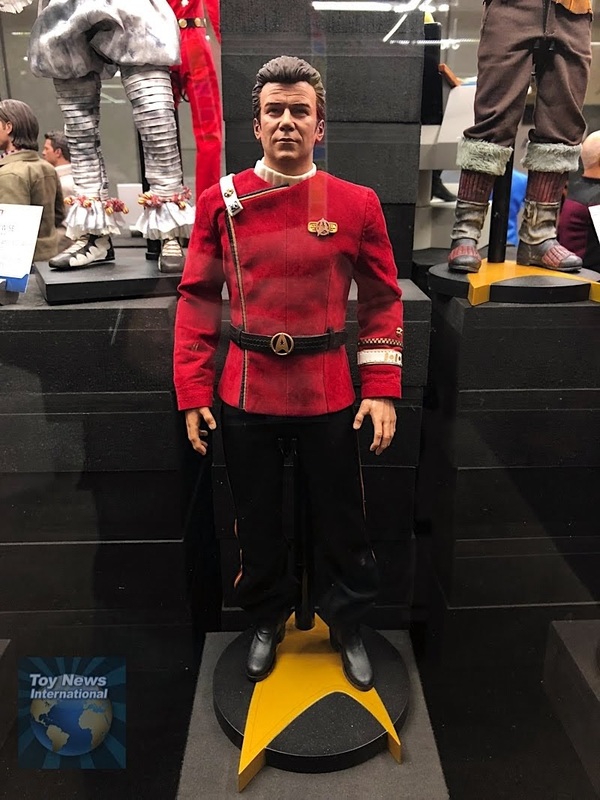 Coverage: First hint, Comic Con display, new image. Purchase: Entertainment Earth, Things From Another World, Forbidden Planet. 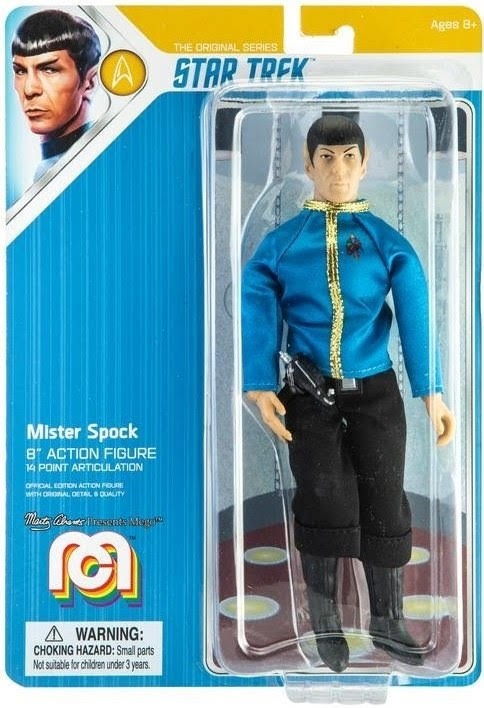 Series/format: TOS Mego action figure. 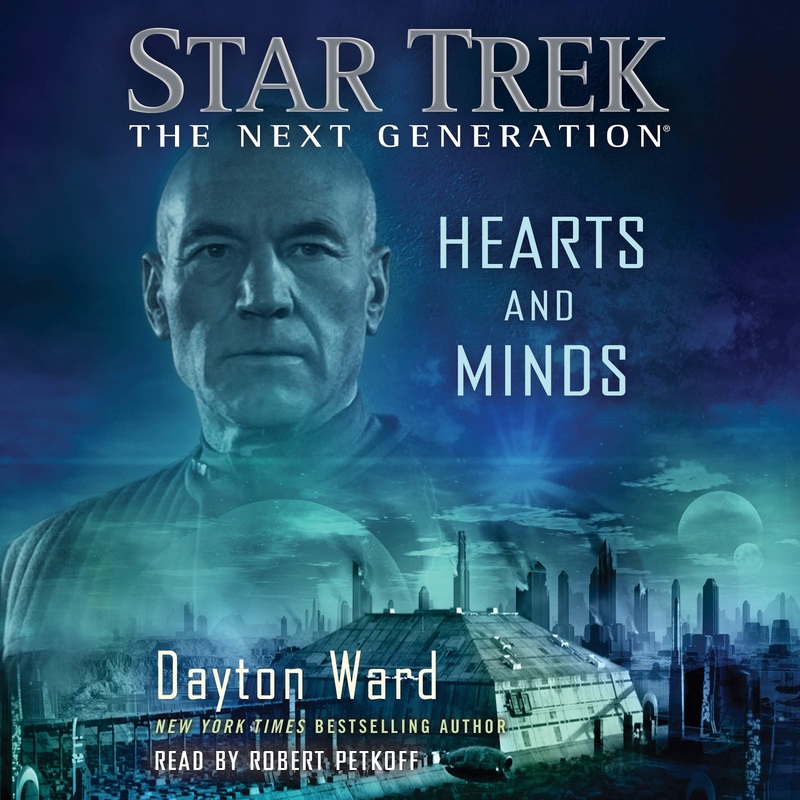 Series/format: TNG novel set after Hearts and Minds and Section 31: Control. Trade paperback and ebook, or audiobook download and CD. Coverage: Blurb, back cover blurb, cover and audiobook confirmation, CD release confirmed. Series/format: CD release of the audiobook edition of the first book in the Prey trilogy. Author: John Jackson Miller. Narrator: Robert Petkoff. 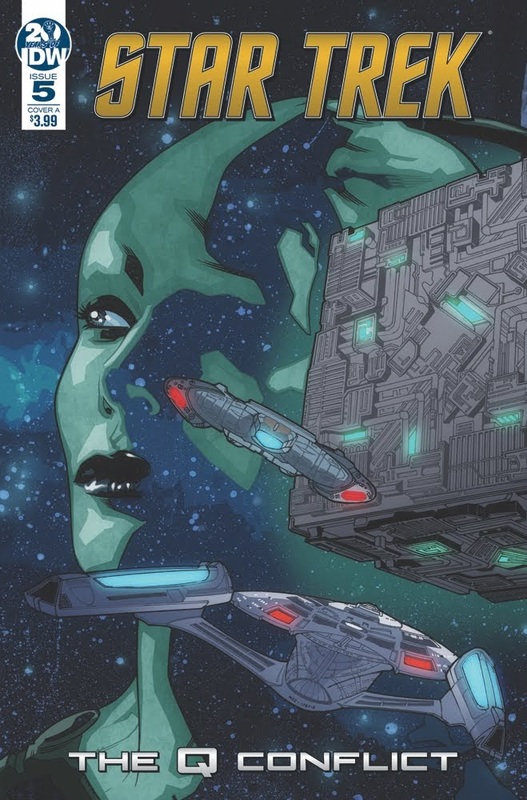 Series/format: Fourth issue of a TOS, TNG, DS9, and Voyager crossover comic featuring Q.
Series/format: First issue in a TOS five-year-mission era comic series. Writers: Jackson Lanzing and Collin Kelly. Artist: Stephen Thompson. 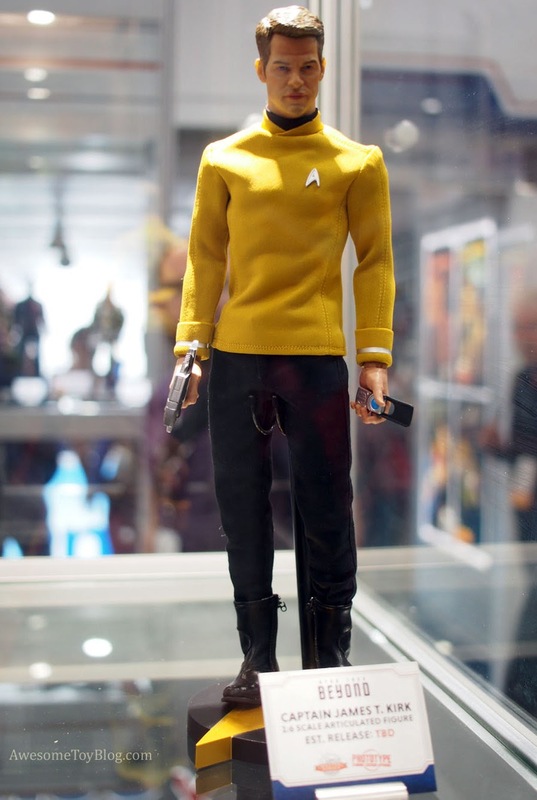 Coverage: Announcement, solicitation and art preview. Writers: Scott and David Tipton. Artists: Tony Shasteen, Angel Hernandez, and Carlos Nieto. 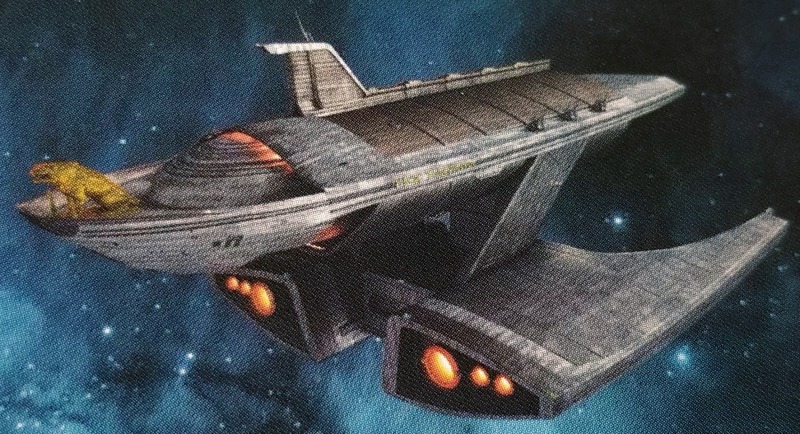 Series/format: Behind-the-scenes nuTrek starship design book, reprinting and expanding upon articles from The Official Starships Collection magazine. The third book in the Designing Starships series. 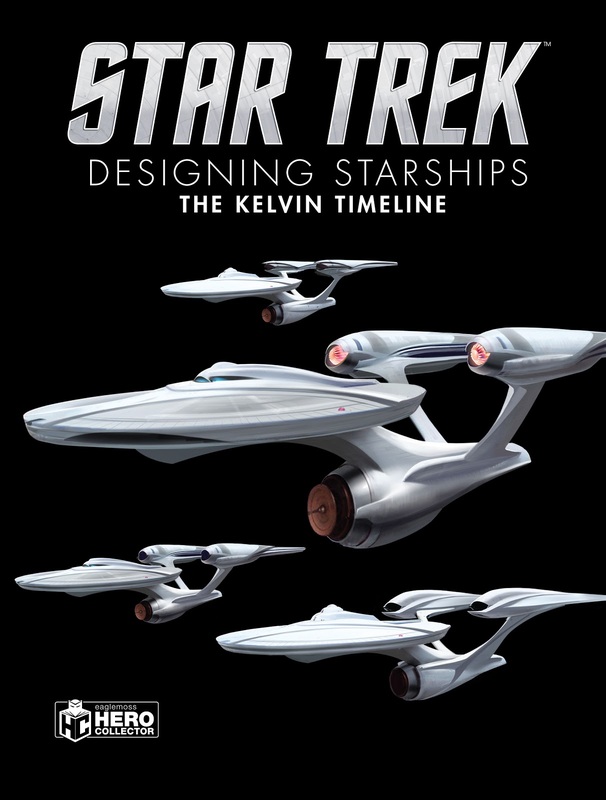 Reissue of the book first published in 2017, with new cover art. Hardcover. Series/format: German language TOS calendar. 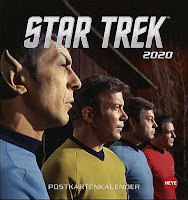 Series/format: German language TOS postcard calendar. 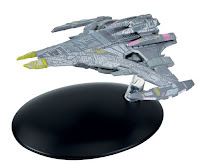 Series/format: DS9 issue in the starship model and magazine series. Coverage: Issue number and rendering, model photo and cover, higher res model photo and cover, model photos. 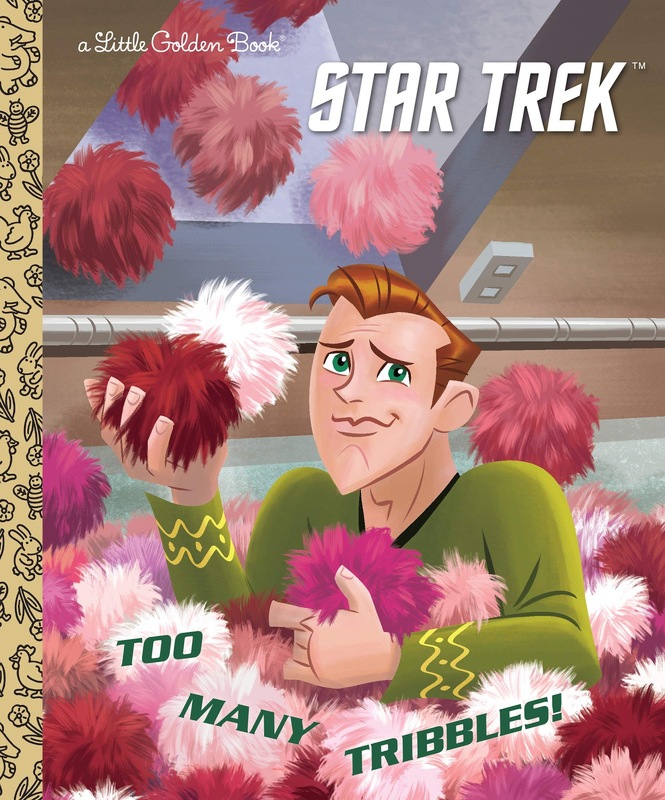 Series/format: TOS novel featuring young pre-Enterprise Kirk. Trade paperback and ebook, or audiobook CD. Publisher: Gallery Books (print and ebook) Simon and Schuster Audio (audio download) and Blackstone Audio (CD). Coverage: First details, author description and CD release confirmed, cover and blurb. 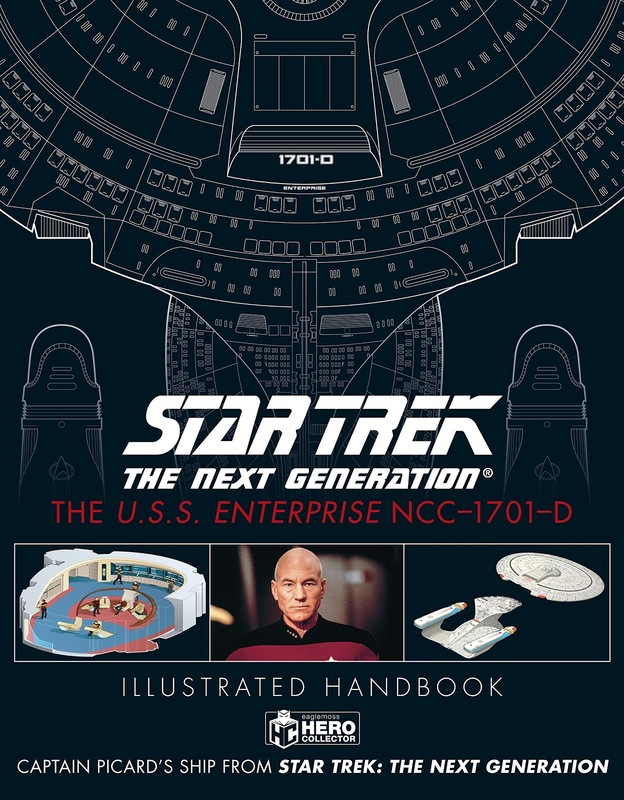 Series/format: CD release of the audiobook edition of the TNG novel. 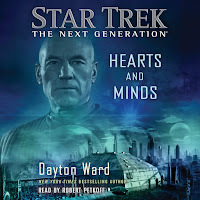 Author: Dayton Ward. Narrator: Robert Petkoff. 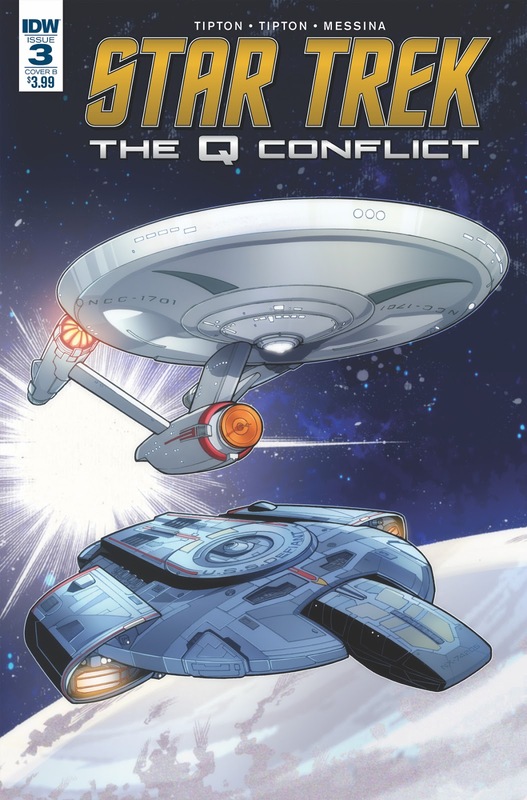 Series/format: Fifth issue of a TOS, TNG, DS9, and Voyager crossover comic featuring Q. 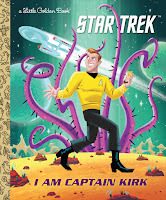 Coverage: Cover art, solicitation cover and blurb. 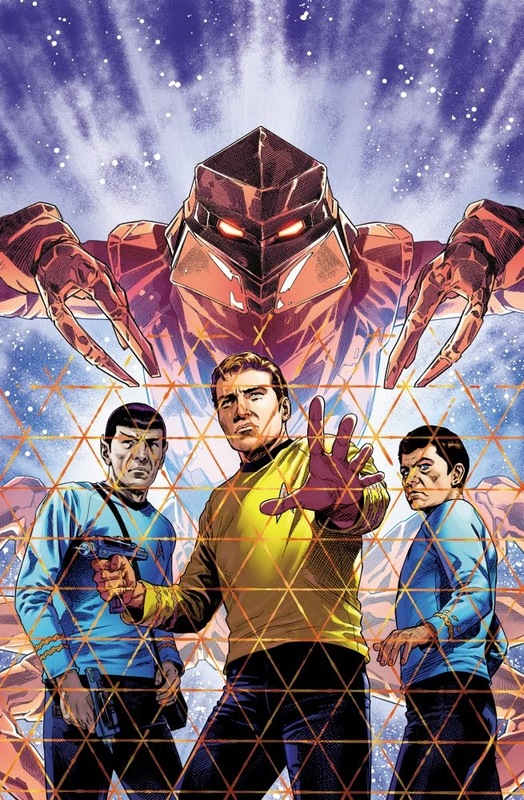 Series/format: Second issue in a TOS five-year-mission era comic series. 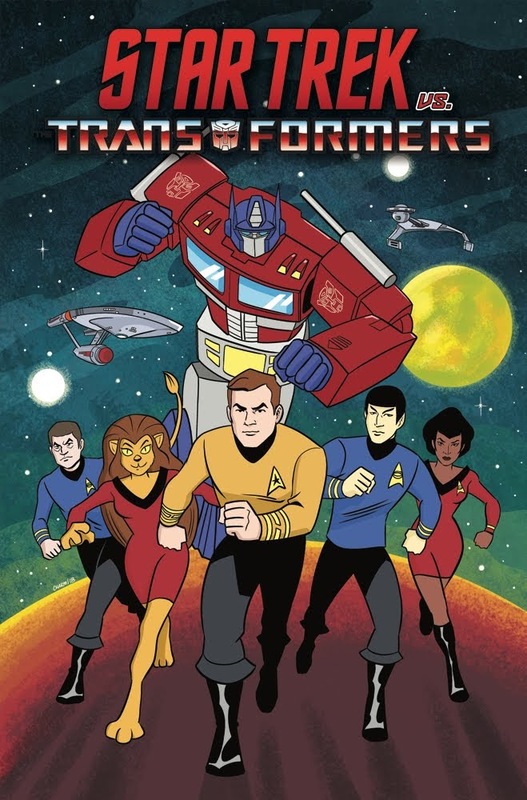 Series/format: Omnibus of the TAS/Transformers crossover comic series. Coverage: Renderings, issue number and rendering, model photos and cover. Coverage: Model photo and cover. 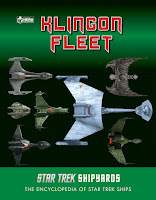 Series/format: Final issue of a TOS, TNG, DS9, and Voyager crossover comic featuring Q.
Series/format: All series Klingon starships encyclopedia and chronology reference book. Hardcover. Author: Ben Robinson, Marcus Riley, and Matt McAllister. 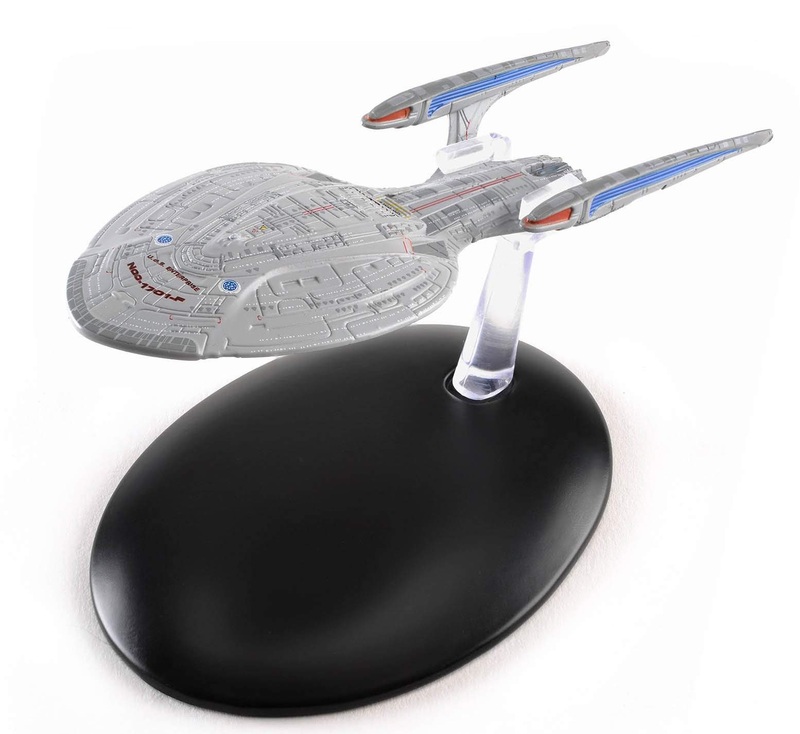 Publisher: Eaglemoss and Penguin Random House. Coverage: Cover and blurb, updated cover and excerpts, further excerpts. 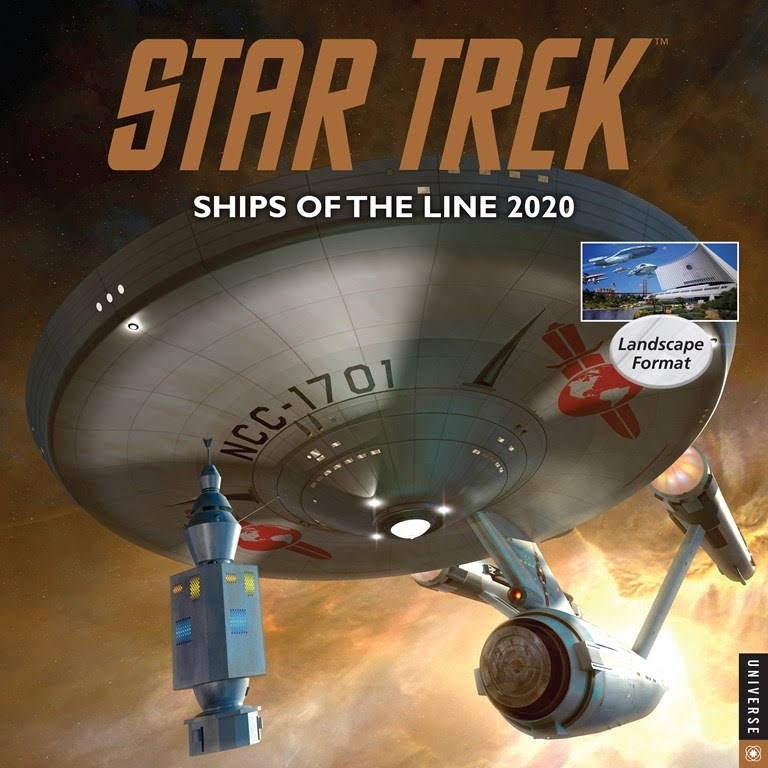 Series/format: TBA issue in the starship model and magazine series. 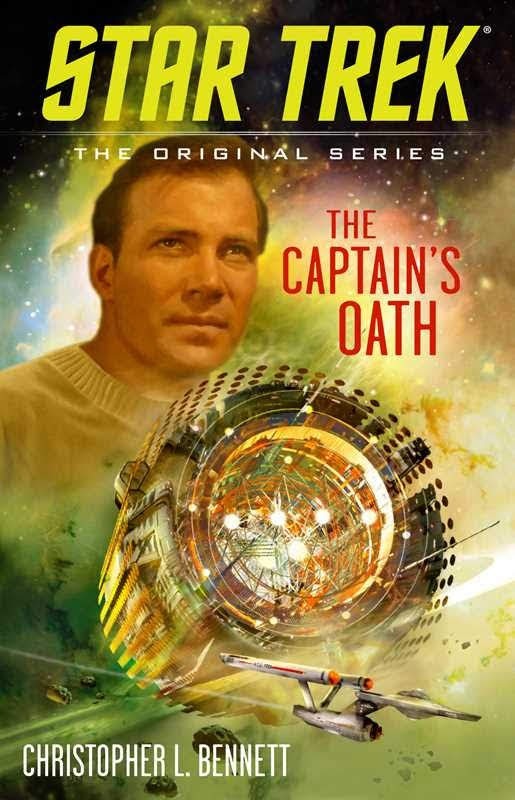 Series/format: Discovery novel featuring Captain Pike's Enterprise during season one of the TV series. Trade paperback or ebook. 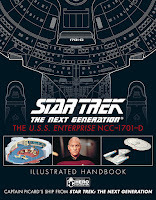 Series/format: TNG starship reference book, based on content from the Star Trek Fact Files. Hardcover. Author: Ben Robinson and Marcus Riley. 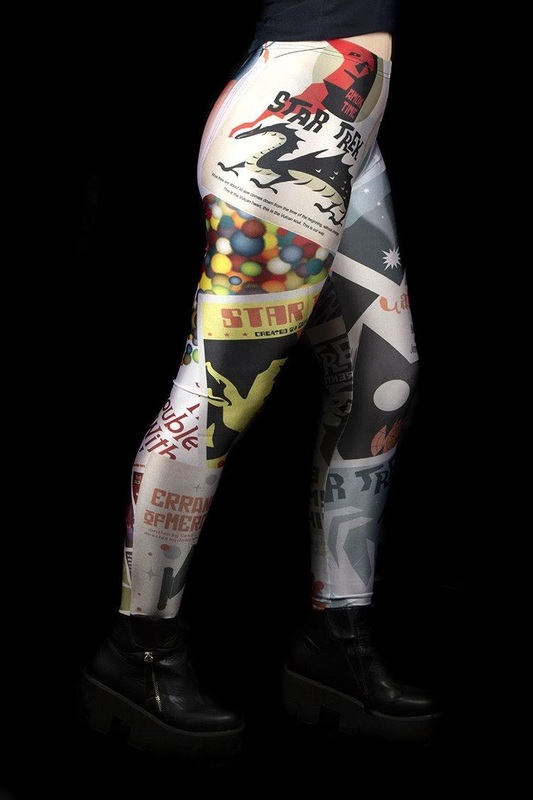 Illustrator: Rob Garrard and Ian Fullwood. Coverage: Cover and blurb, author description, updated cover and excerpts, further excerpts. 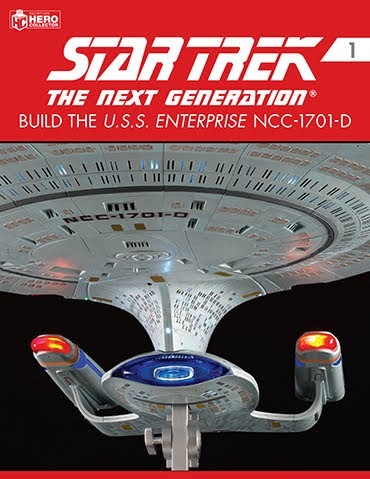 Notes: The book is being issued either on it's own, or packaged with a model of the USS Enterprise-D.
Book and model version: Amazon. 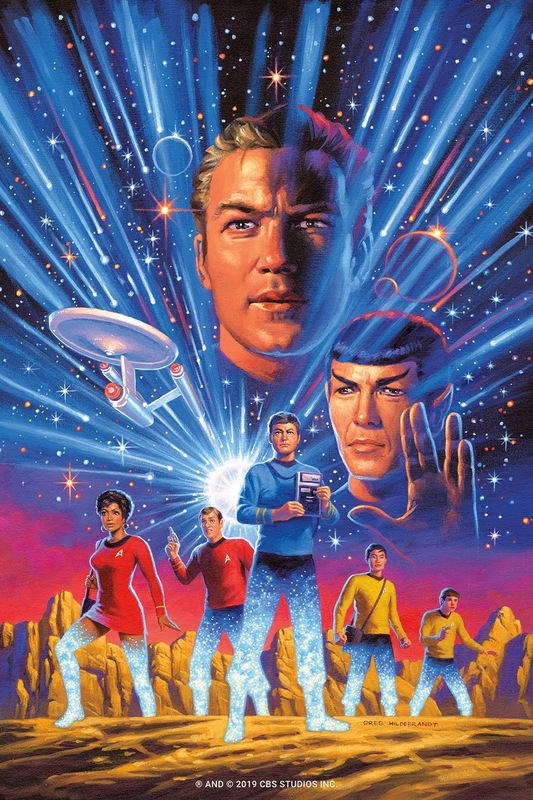 Series/format: TOS five-year mission era novel. Trade paperback or ebook. Coverage: Blurb, back cover blurb, publication date change, CD release confirmed, cover. 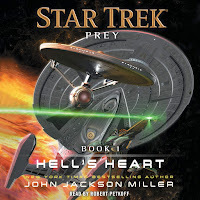 Audiobook CD: Amazon, Barnes and Noble. 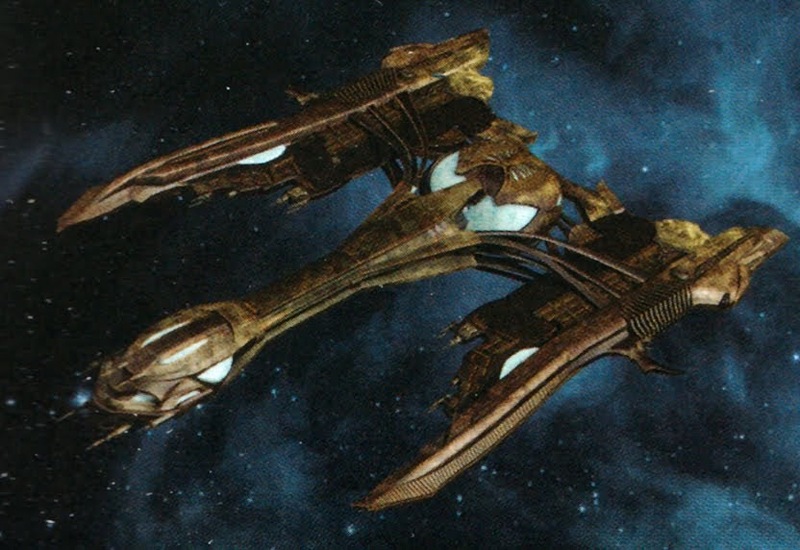 Series/format: Prime timeline starship art calendar. 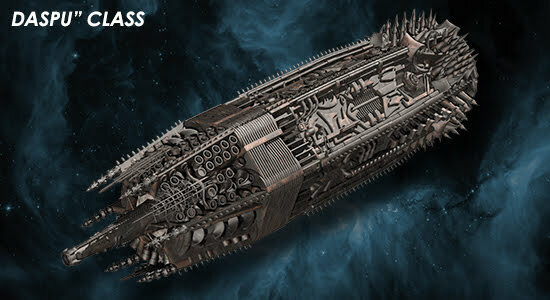 Artists: Doug Shrock, Doug Drexler, Ali Ries, DM Phoenix, Bill Krause, Alain Rivard, John Eaves, Dan Uyeno, Matthew Cushman, Matt Boardman, Gabriel Koerner, Michael Wiley, Tobias Richter, and Jeff Summers. Coverage: Temp covers and preview pages, final covers and preview pages. Purchase: Amazon, Barnes and Noble. 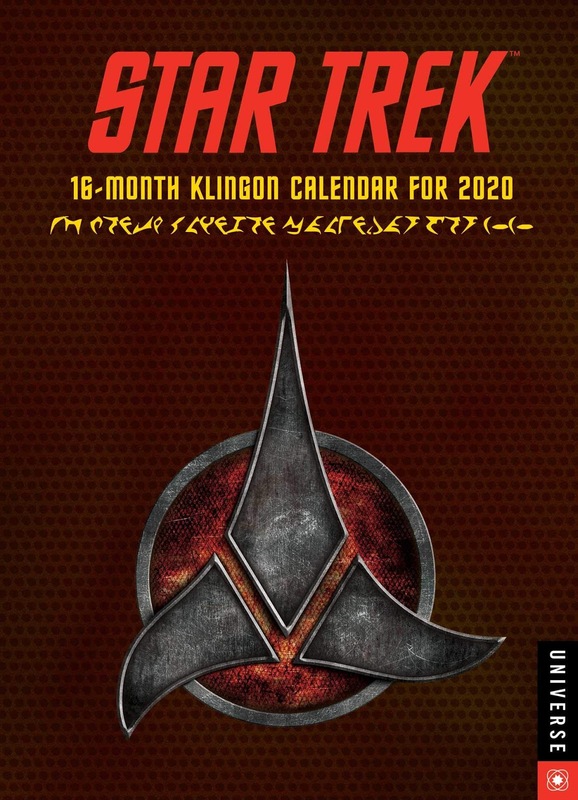 Series/format: All series Klingon themed engagement calendar. 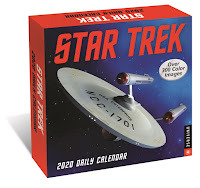 Series/format: All series daily calendar. 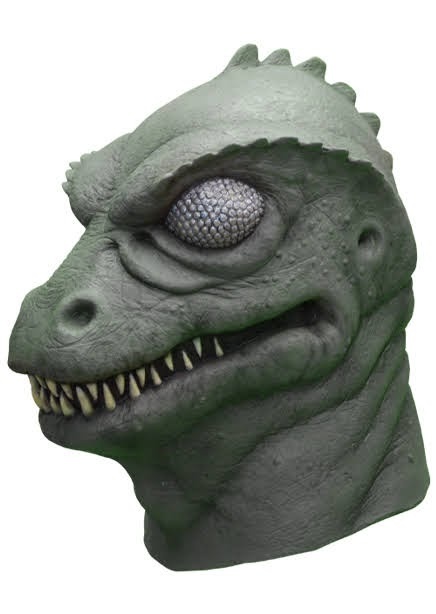 Series/format: TOS full-head costume mask. Maker: Trick or Treat Studios. 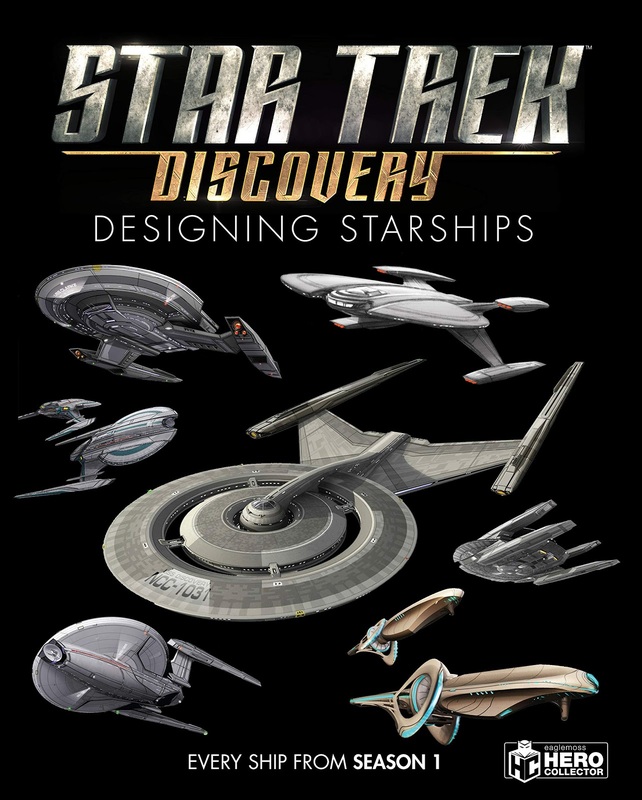 Series/format: Omnibus edition of a TOS, TNG, DS9, and Voyager crossover comic featuring Q.
Series/format: Discovery focused book in the all series behind the scenes starships design reference book series. Coverage: First hint, cover and blurb. 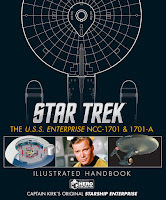 Series/format: TOS starship reference book, based on content from the Star Trek Fact Files. Hardcover. 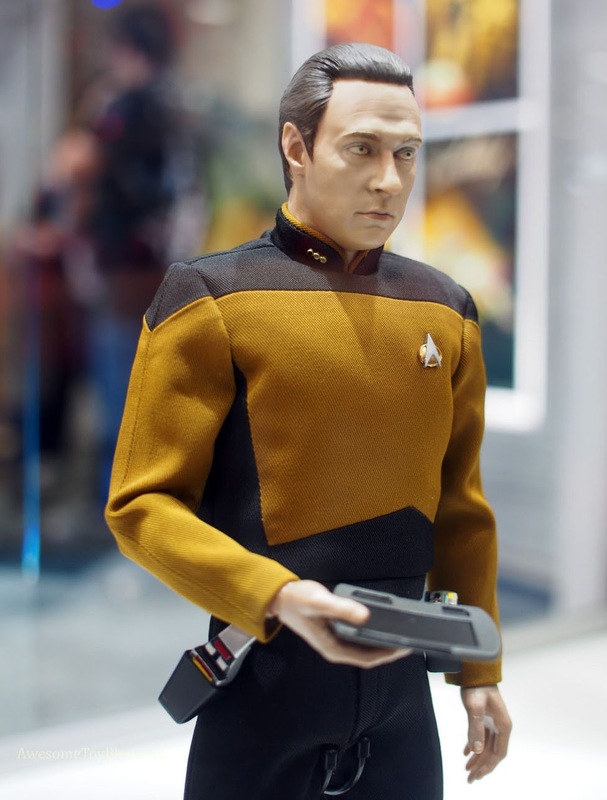 Notes: The book is being issued either on it's own, or packaged with a model of the USS Enterprise-A. 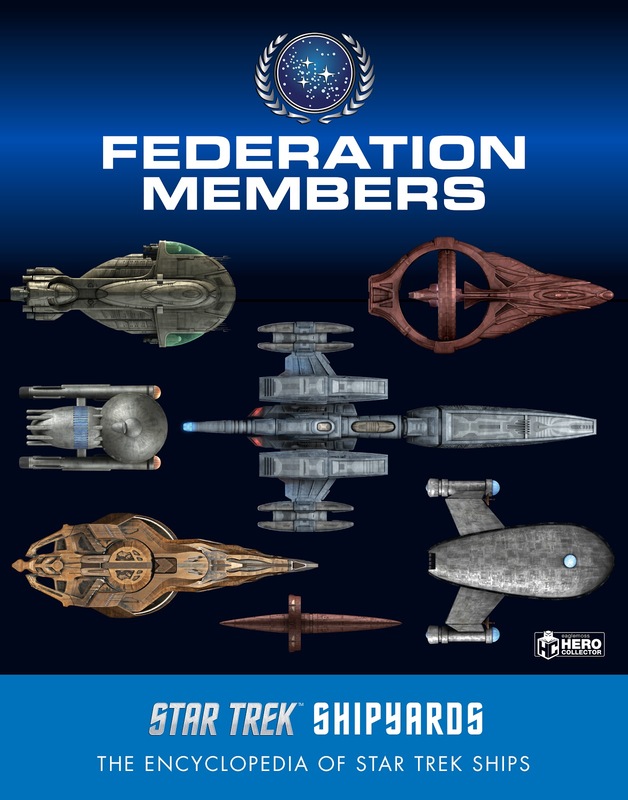 Series/format: All series Federation starships encyclopedia and chronology reference book. Hardcover. Author: Ben Robinson, Marcus Riley. 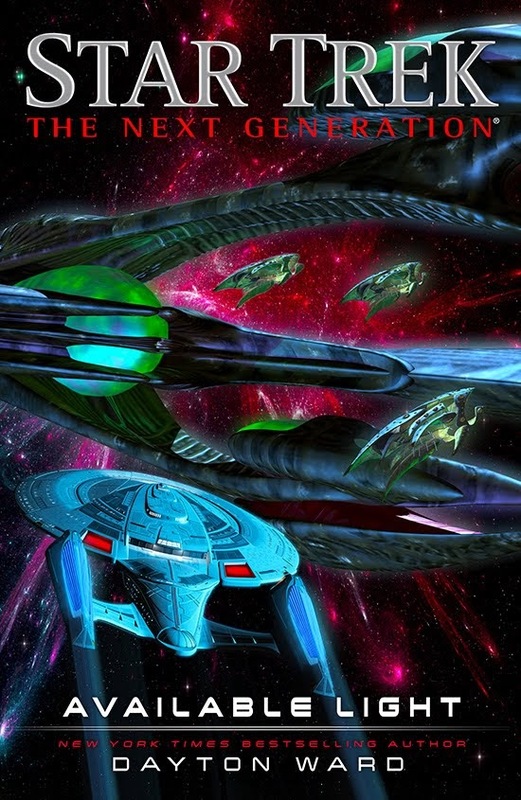 Series/format: Tenth novel in the Full Circle Voyager relaunch series, and follow-up to Architects of Infinity. 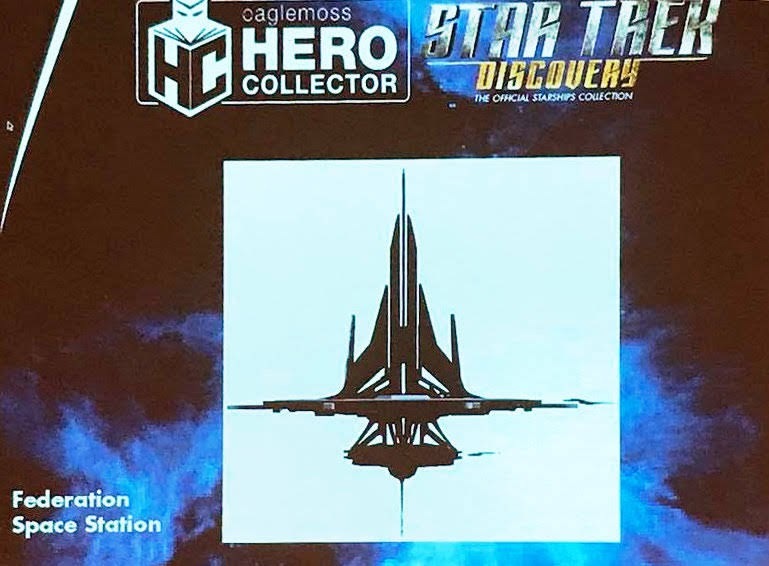 Coverage: First hint, first details, title, delay confirmed. Notes: This book has been contracted, but no release date has yet been established. The editor previously suggested a 2017 release date, but the book preceding it was later delayed until 2018 itself. 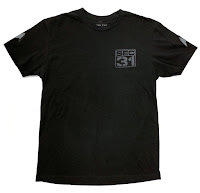 Series/format: TNG-era novel and sequel to Section 31: Control and A Time to Heal. 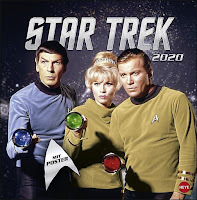 Series/format: Apparent sequel to the TOS prequel novel Collision Course, featuring young Kirk and Spock at Starfleet Academy. Author: William Shatner with Judith and Garfield Reeves-Stevens. 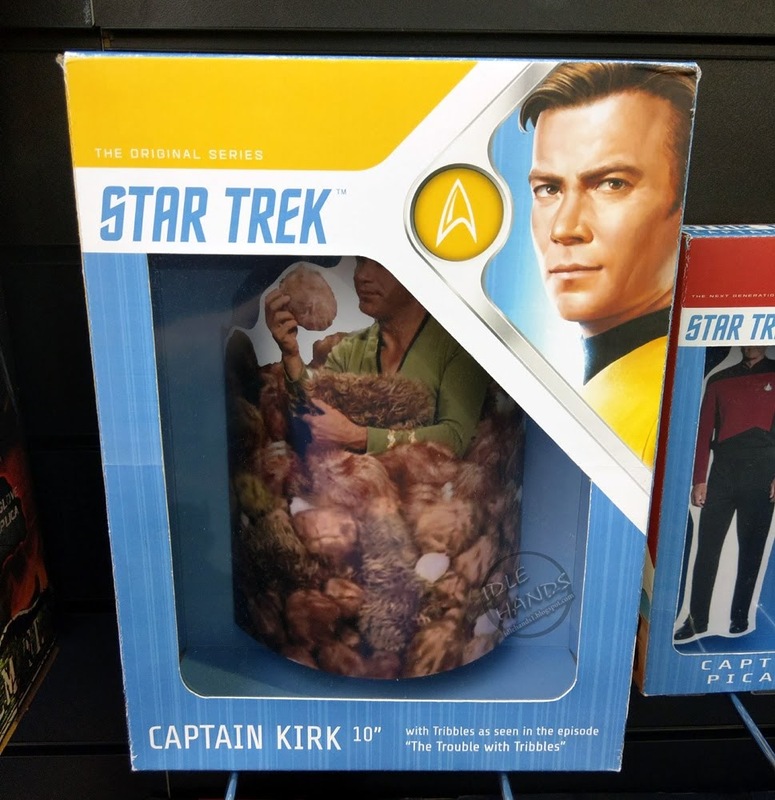 Notes: This book is only known by online retailer listings, no other details have yet been announced but the title and a possible December release date. 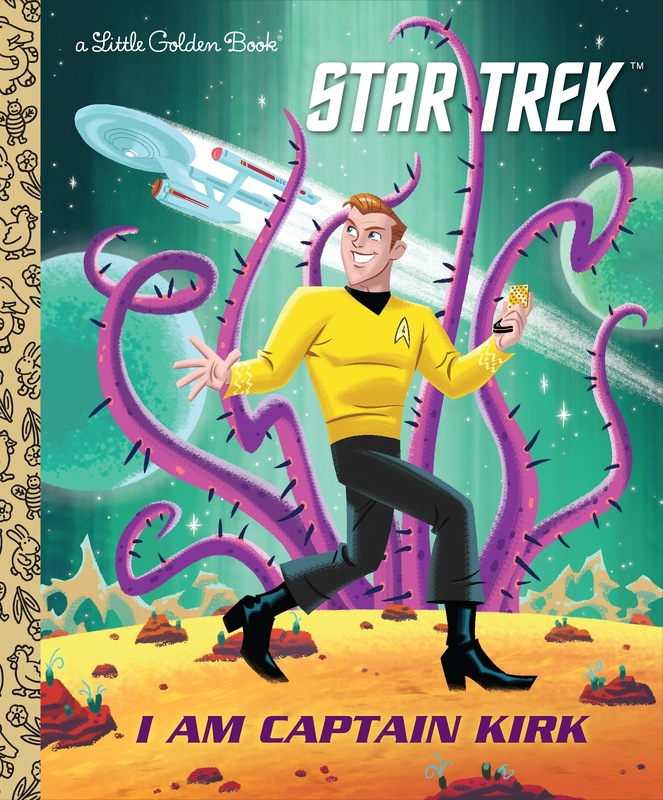 Coverage: Announcement, author description, solicitation cover and blurb, cancellation, resurrection rumour. 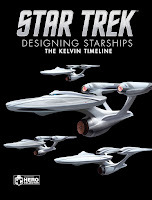 Notes: This book was one of four Kelvin timeline novels originally planned for publication in 2010. All four were abruptly cancelled just months before publication. In December 2017, author David Mack reported he had heard rumours his book might be in consideration to finally be published, but no official announcement or scheduling has yet been forthcoming. 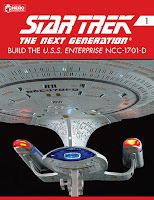 Series/format: TNG novel focused on Data, follow-up to The Light Fantastic. 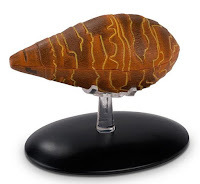 Coverage: Author comments, editor comments, author pitch. Notes: The author has spoken about the idea for this book, but as of June 2016 the editor had yet to pick up any of proposals so far offered. 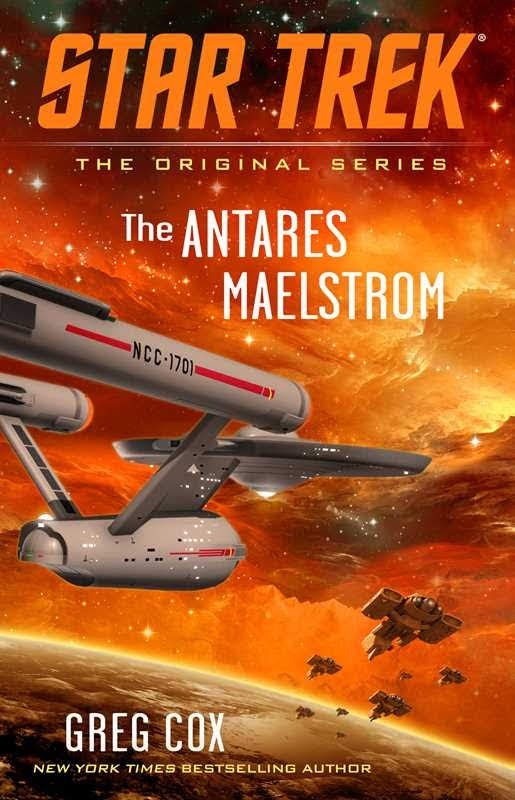 Series/format: Titan novel set after Sight Unseen. Notes: The author has spoken about the idea for this book, but it has not yet been confirmed for publication. Series/format: Unspecified Star Trek book(s). 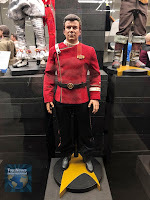 Notes: The author has stated, in 2017, that he "expect[s] to write some more Trek books in the near future" following "discussions with the publisher". 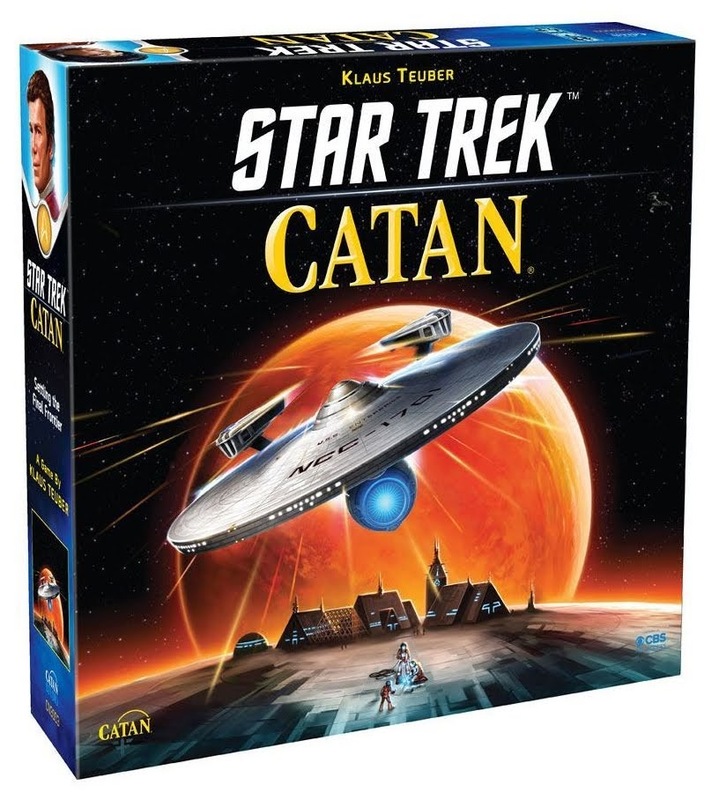 No books have yet been confirmed though, nor indeed if the publisher is of Star Trek novels, or other Star Trek books. 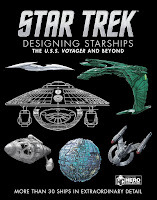 Series/format: DS9 focused book in the all series behind the scenes starships design reference book series. 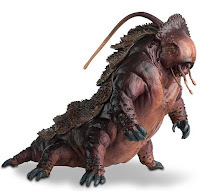 Series/format: Behind the scenes reference book focusing on the work of visual effects supervisor Dan Curry. 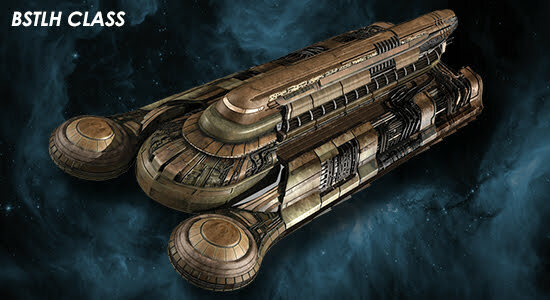 Series/format: Second episode of the second season of the TV series Discovery. 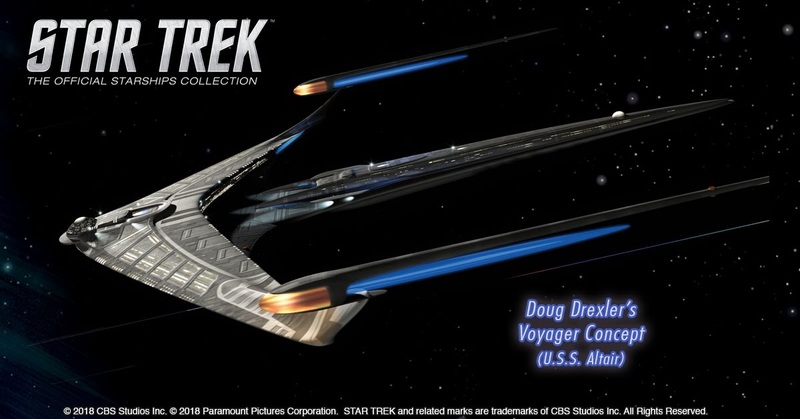 Series/format: Third episode of the second season of the TV series Discovery. 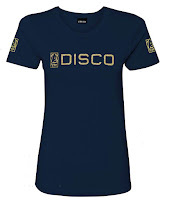 Series/format: Fourth episode of the second season of the TV series Discovery. 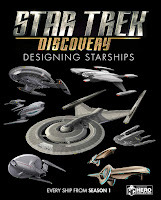 Series/format: Fifth episode of the second season of the TV series Discovery. 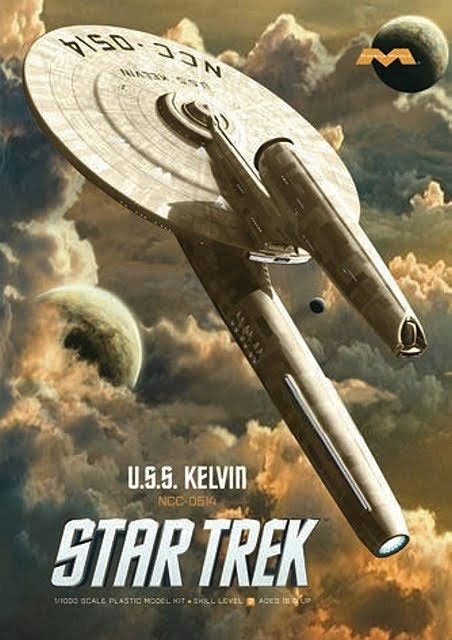 Series/format: Sixth episode of the second season of the TV series Discovery. 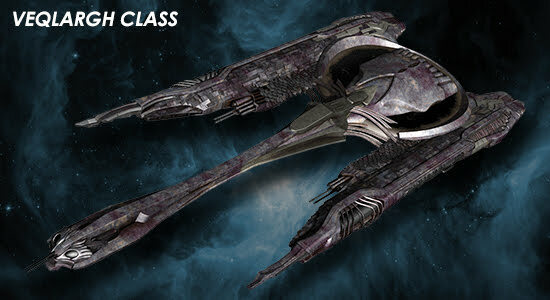 Series/format: Seventh episode of the second season of the TV series Discovery. 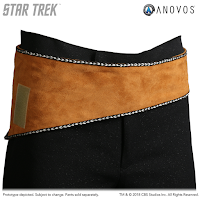 Series/format: Eighth episode of the second season of the TV series Discovery. Series/format: Ninth episode of the second season of the TV series Discovery. 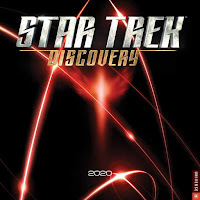 Series/format: Tenth episode of the second season of the TV series Discovery. 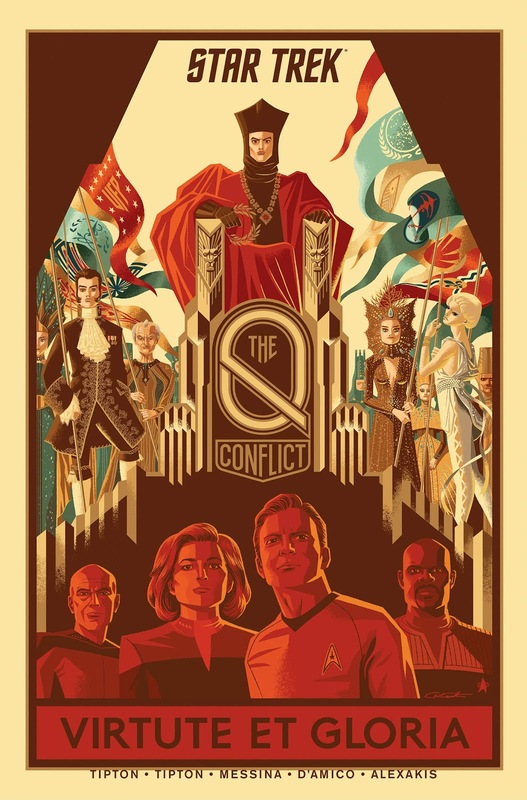 Series/format: Eleventh episode of the second season of the TV series Discovery. 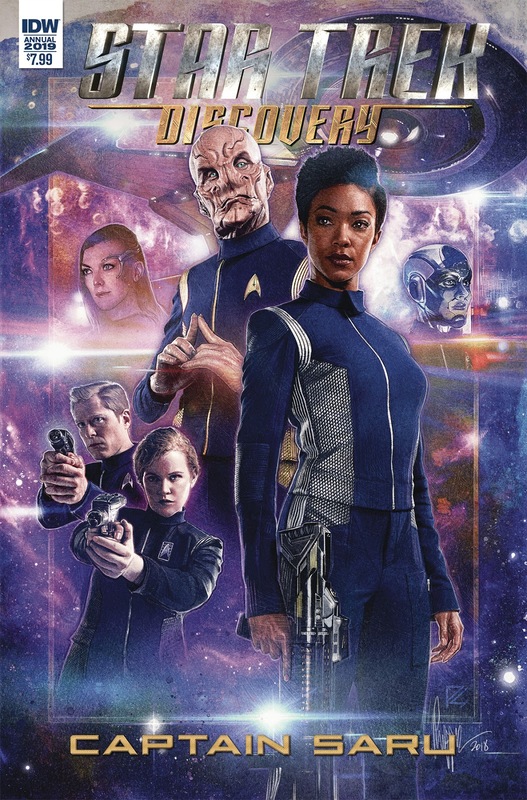 Series/format: Penultimate episode of the second season of the TV series Discovery. 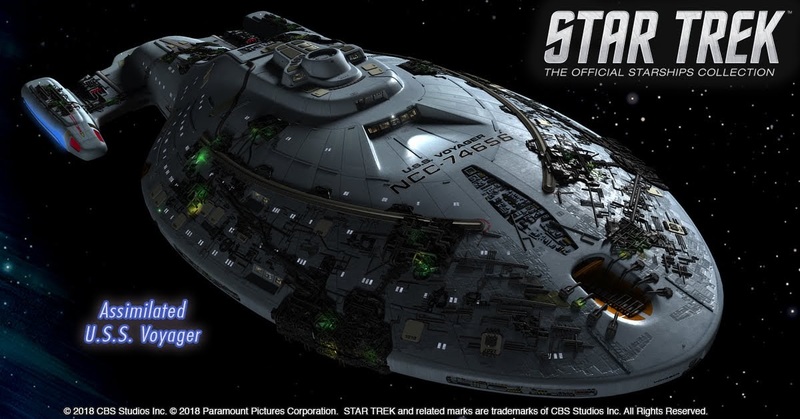 Series/format: Final episode of the second season of the TV series Discovery. 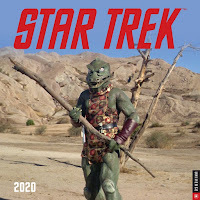 Series/format: TV project bring back Jean-Luc Picard. Writer: Kirsten Beyer, Alex Kurtzman, Akiva Goldsman, and Michael Chabon. Director: TBA. Production companies: CBS Television Studios. Coverage: First hint, official announcement and writer details. Series/format: Wrath of Khan related TV project, described as a miniseries and a trilogy. Writer: Nick Meyer. Director: TBA. Notes: This series has been in development sine at least 2017, but is apparently on hold pending the outcome of CBS/Paramount merger talks. 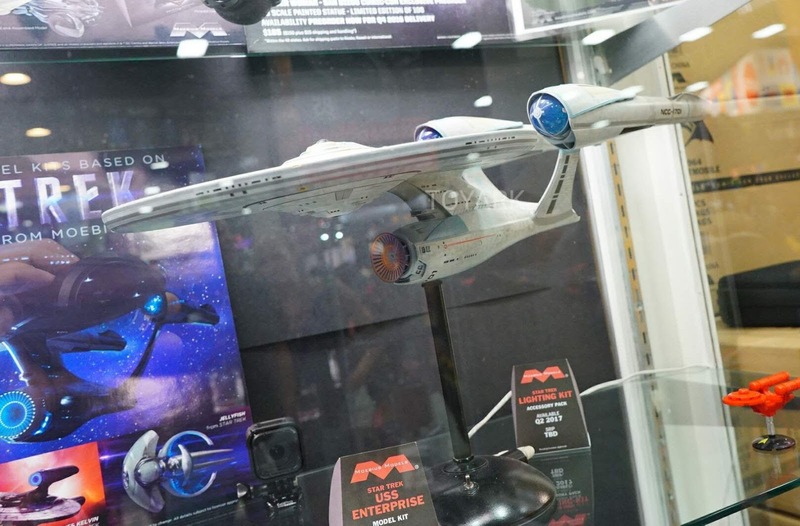 Coverage: First hint, trilogy and status, inclusion in CBS wider Star Trek plans. 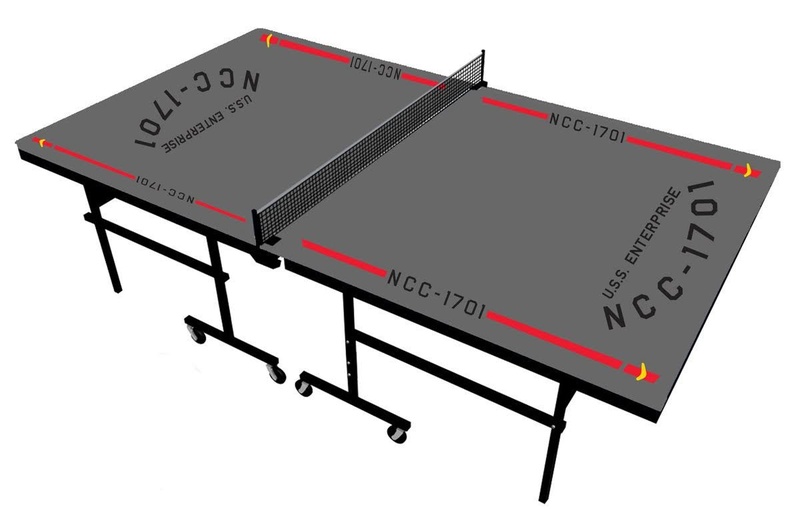 Series/format: TV project set at Starfleet Academy. Writer: Stephanie Savage and Josh Schwartz. Director: TBA. 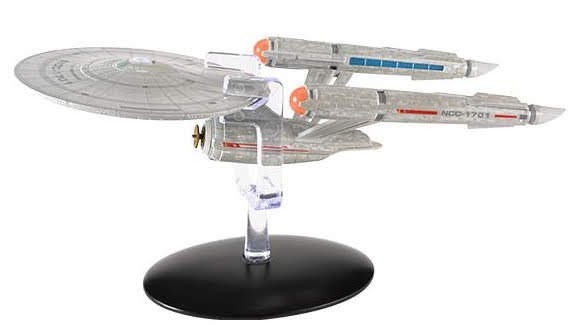 Series/format: Large scale model of Discovery's USS Enterprise, with light features. 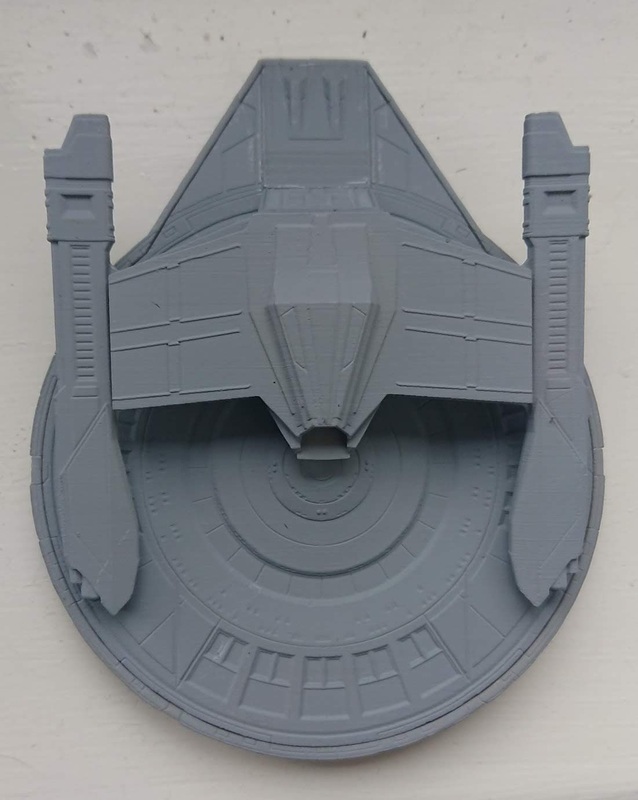 Series/format: TOS model starship toy. 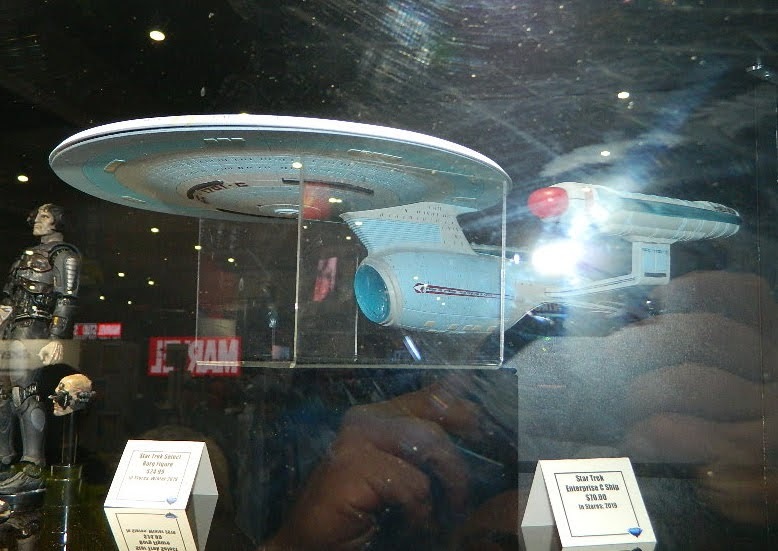 Coverage: Toy Fair plans display, prototype, better quality image of the prototype. 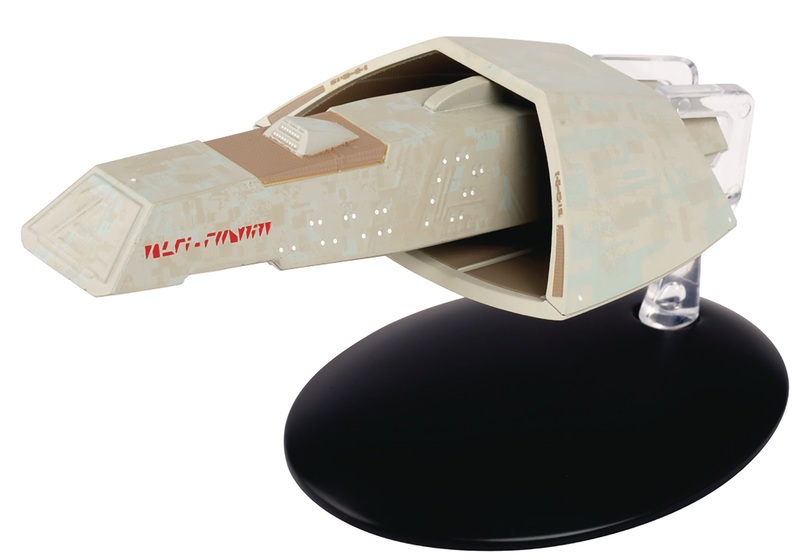 Series/format: TNG model starship toy. Series/format: TNG special-sized starship model and magazine from the ongoing series. 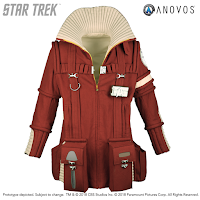 Coverage: Initial plans, fan survey, confirmation. 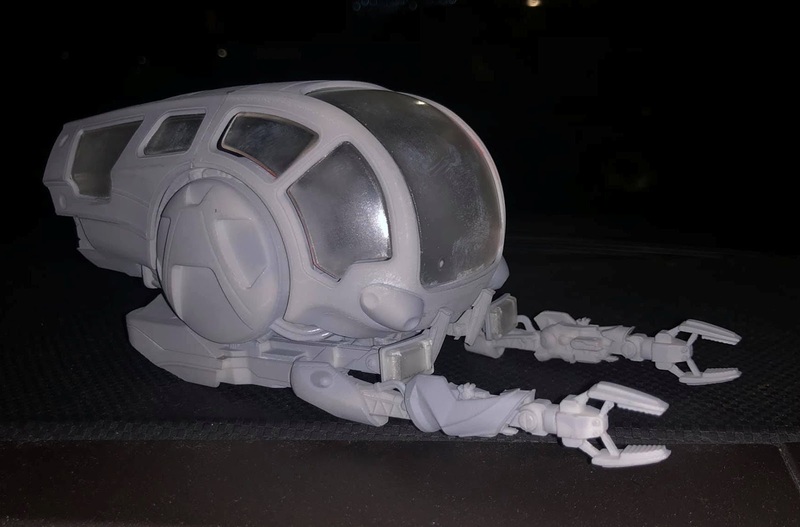 Coverage: Coming soon image, prototype. Coverage: Promotional poster image, coming soon image, prototype. 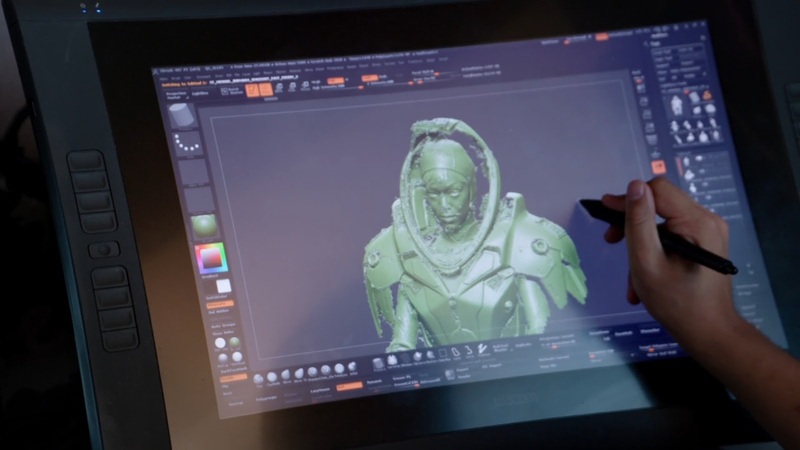 Coverage: Rendering, promotional poster images, prototype. 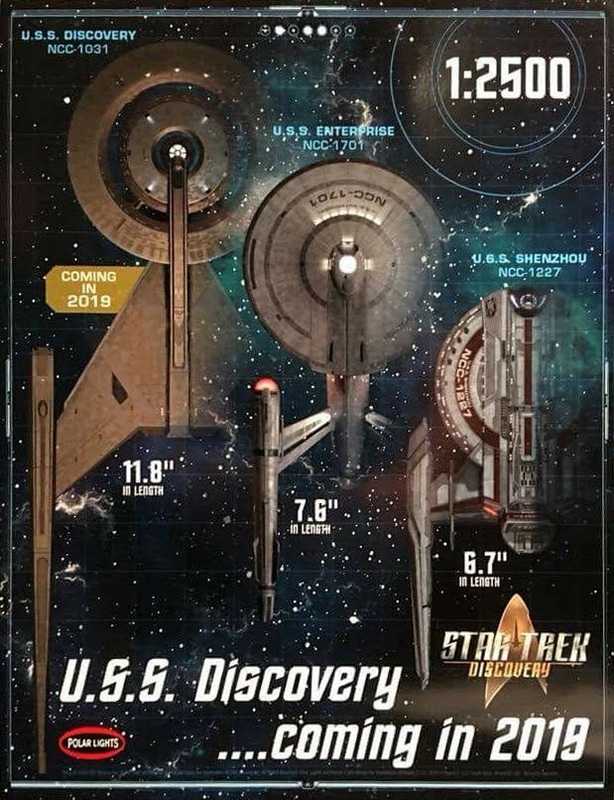 Coverage: Promotional poster image, coming soon image. Coverage: Rendering, promotional poster image. 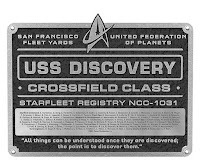 Series/format: Discovery starbase model and magazine from the ongoing series. 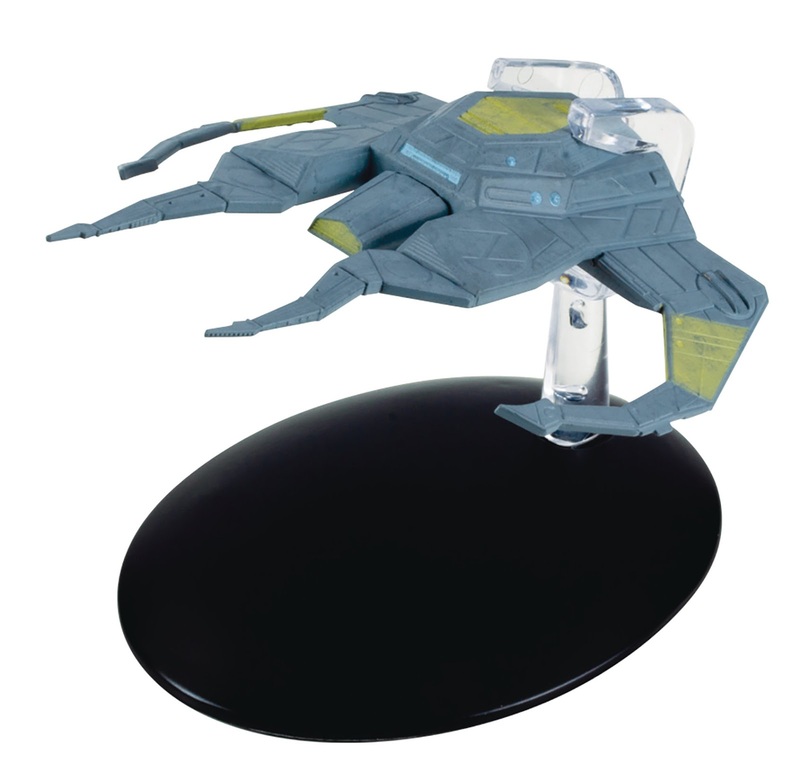 Series/format: Voyager starship model and magazine bonus issue from the ongoing series. 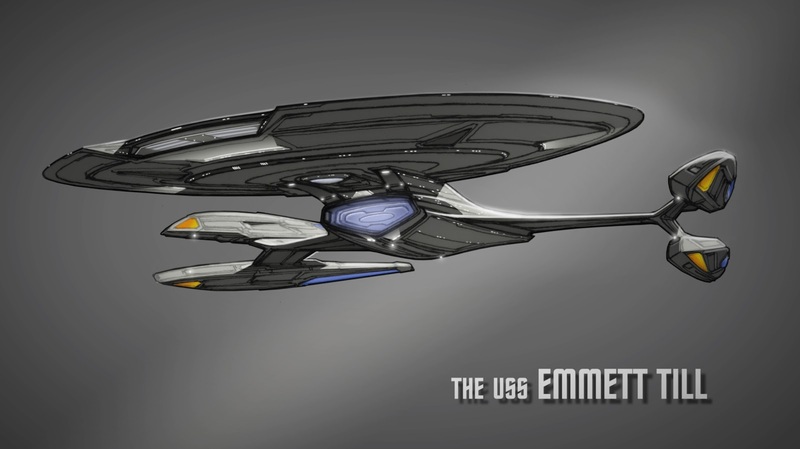 Coverage: Fan survey hint, announcement and rendering. 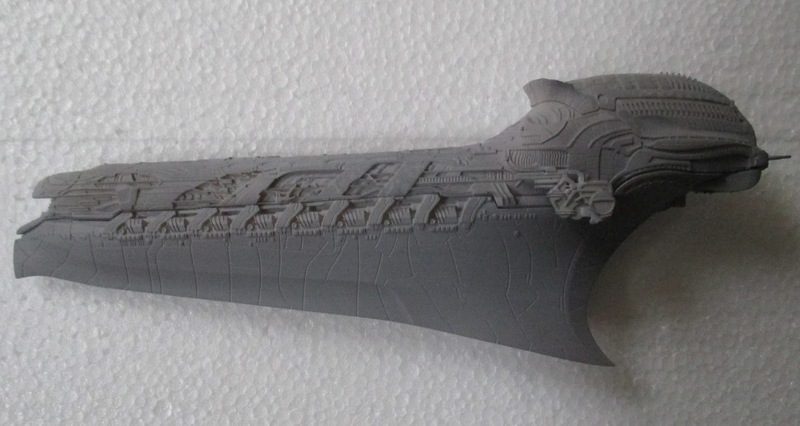 Coverage: First hint, fan survey hint, announcement and rendering. 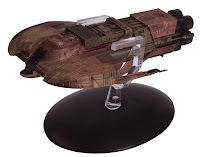 Series/format: DS9 starship model and magazine bonus issue from the ongoing series. 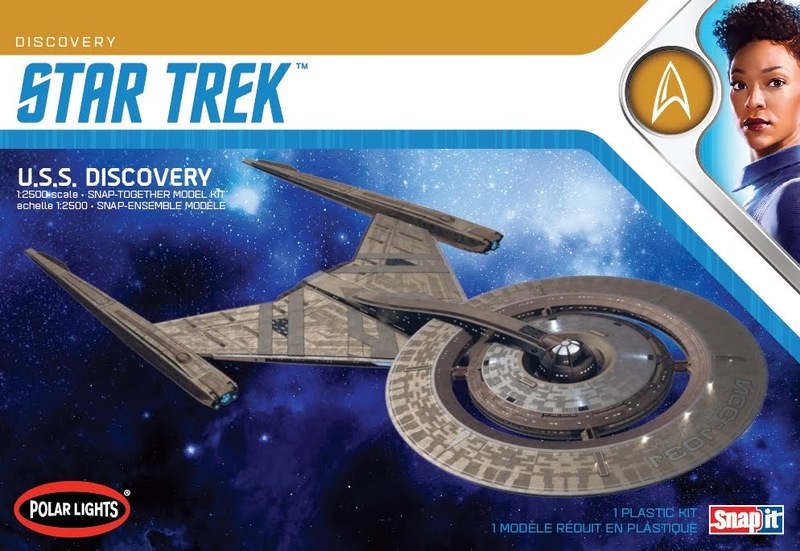 Series/format: 1:2500 scale Discovery model kit. 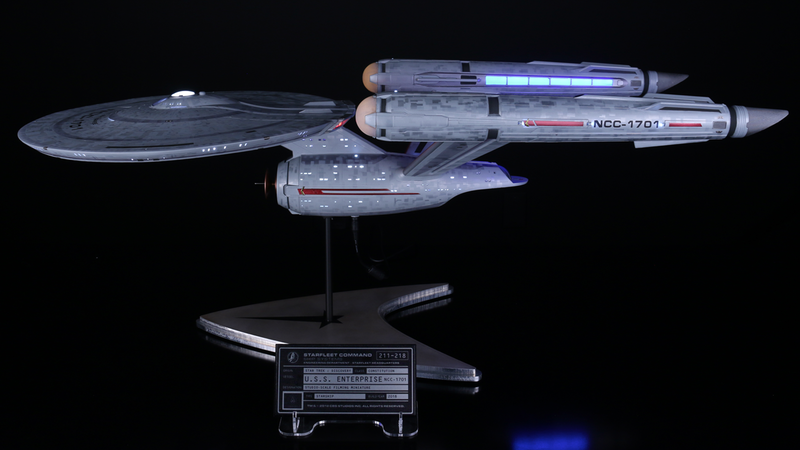 Publisher: Round 2 Models/Polar Lights. 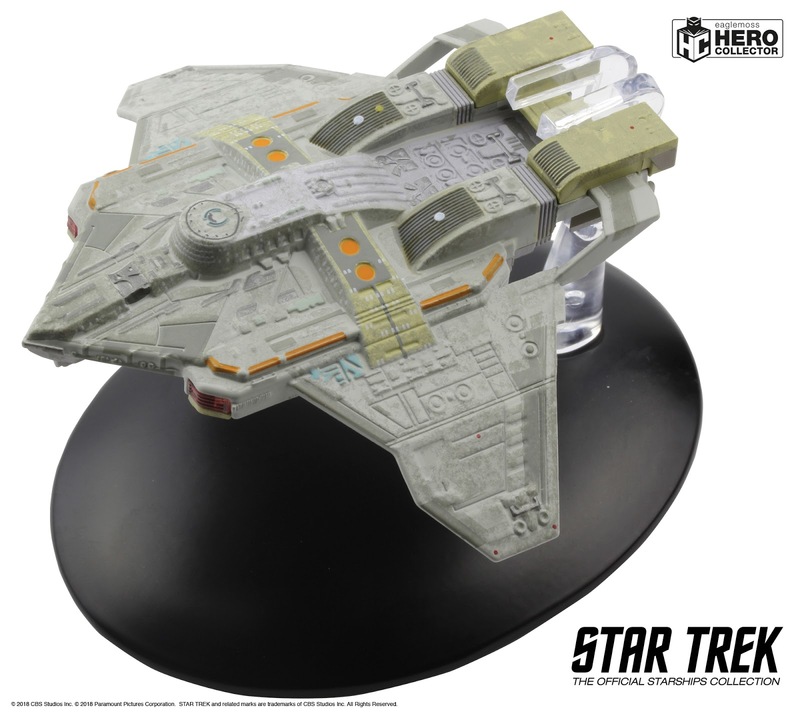 Coverage: Announcement, box art and model preview. 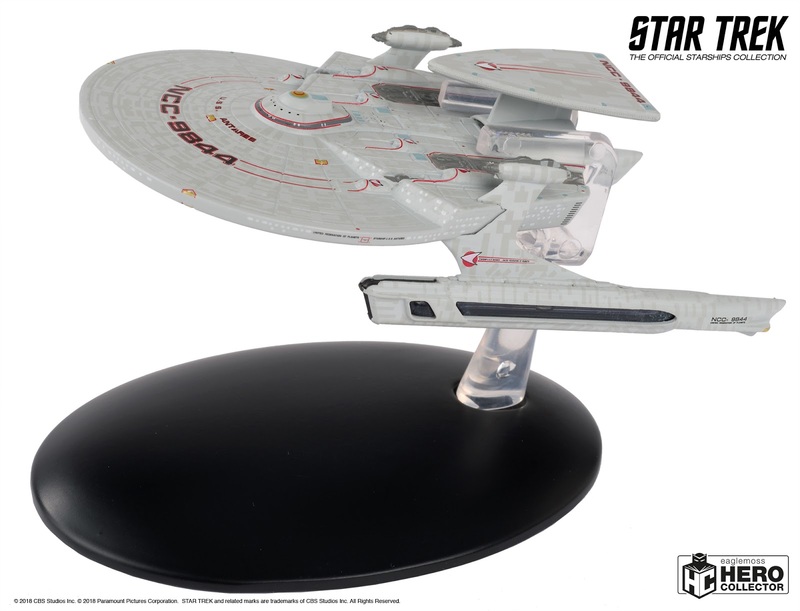 Notes: Round 2 are also considering additional releases of the ship at 1:1400 or 1:1000 scales. Notes: Round 2 are considering releases of this ship, at either 1:2500, 1:1400 or 1:1000 scales. Series/format: 1:350 scale TOS model kit. Notes: As of December 2017 this was a proposed future release, but it has not yet been confirmed for production. 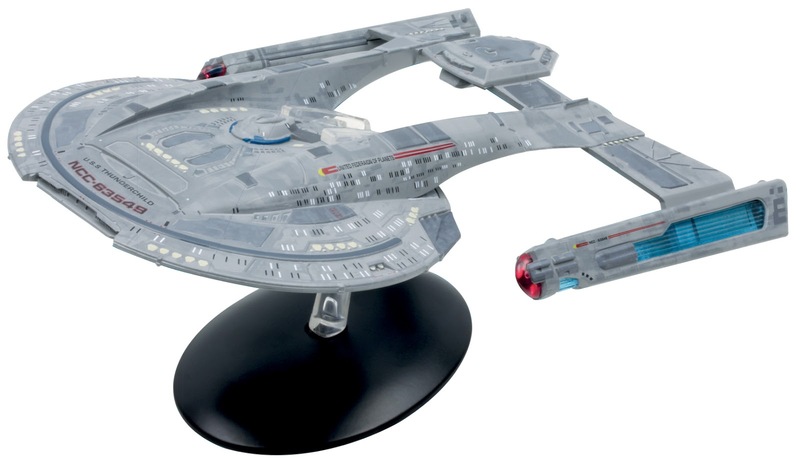 Series/format: 1:1000 scale TOS model kit set, including reissue of the Enterprise model, and a new dry dock kit. 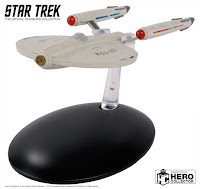 Series/format: nuTrek starship model kit. 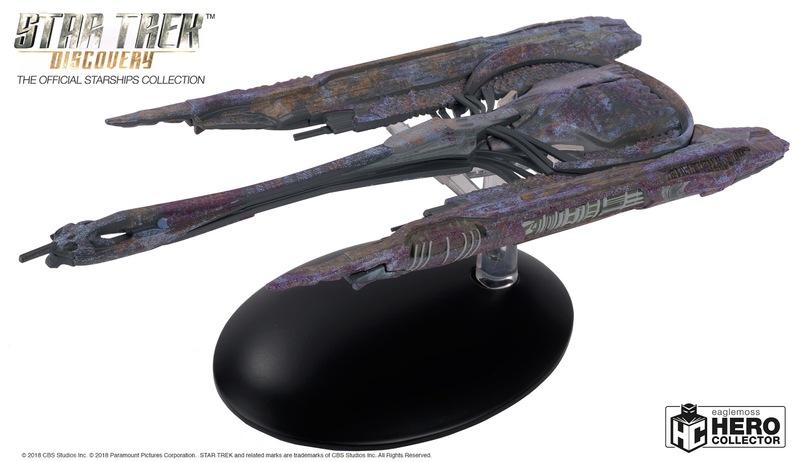 Coverage: First details, box art, model photos, more model photos. Series/format: Pair of 1:4 scale Discovery sculptures. Series/format: 1/6 scale articulated TNG action figure. 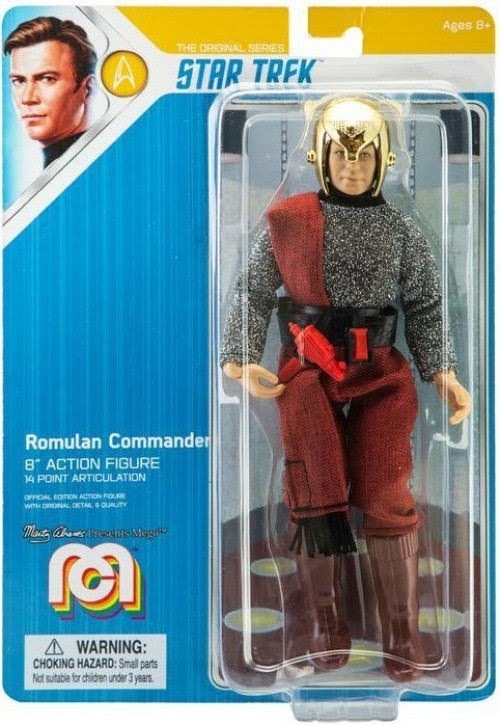 Series/format: 1/6 scale articulated nuTrek action figure. 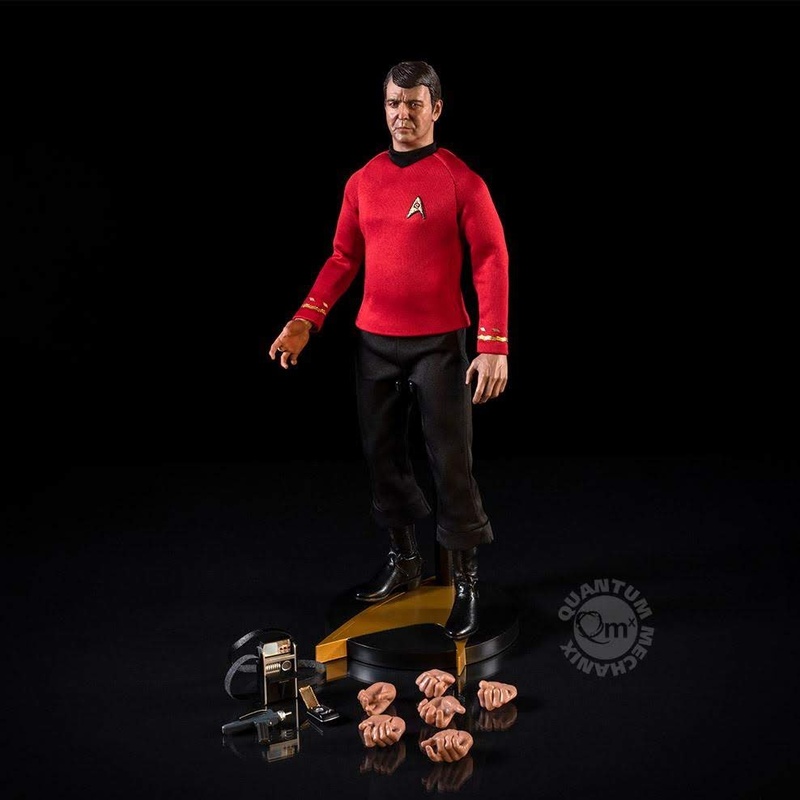 Series/format: 1/6 scale articulated Discovery action figure. 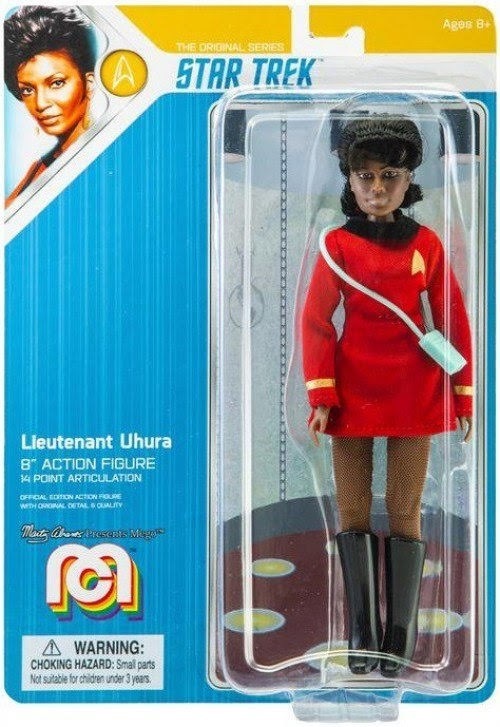 Series/format: Seven inch Discovery action figure. 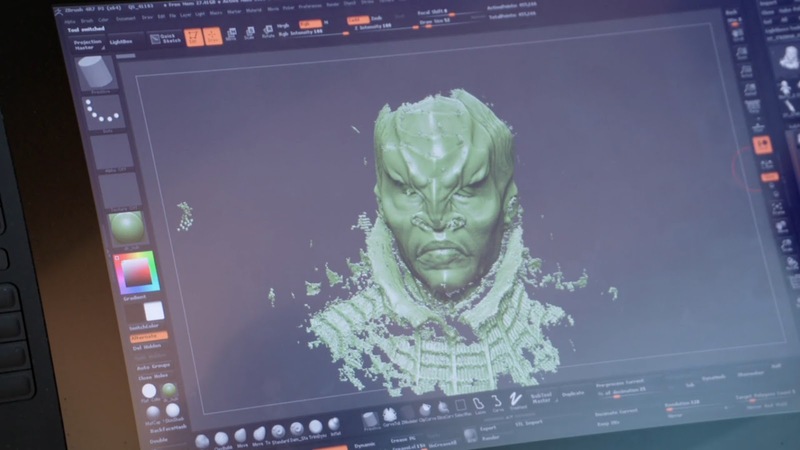 Coverage: Announcement, 3D scan image. 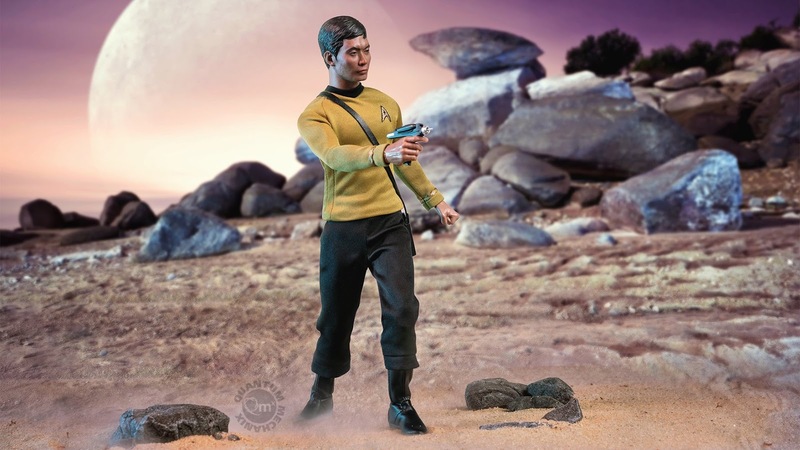 Series/format: Ten inch TOS action figure, based on the episode The Trouble with Tribbles. 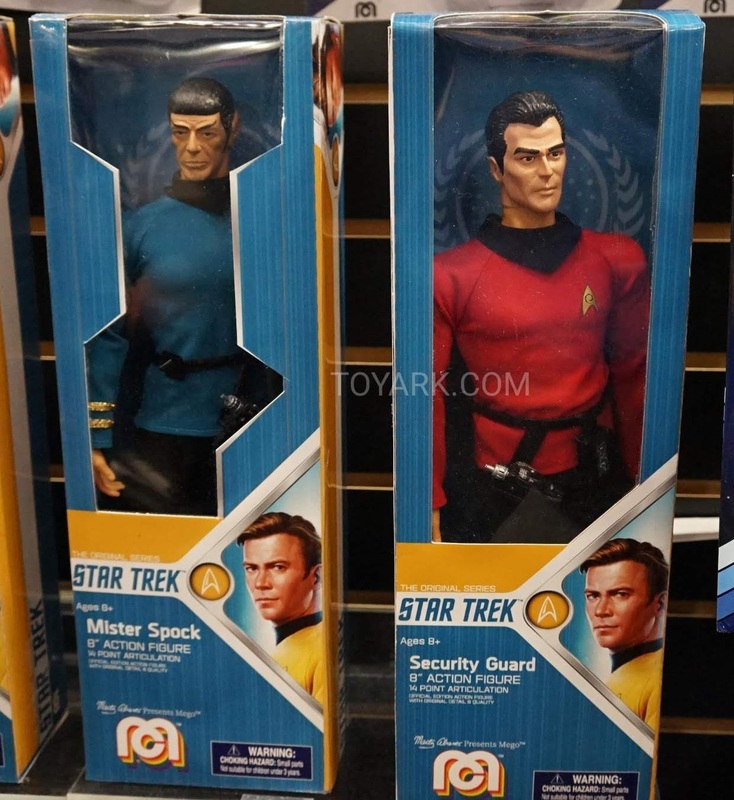 Coverage: Announcement, Toy Fair display. 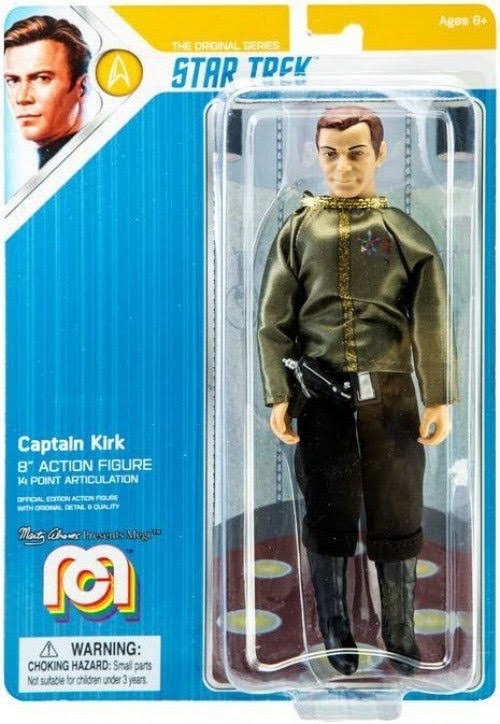 Series/format: TOS Mego 14 inch action figure. 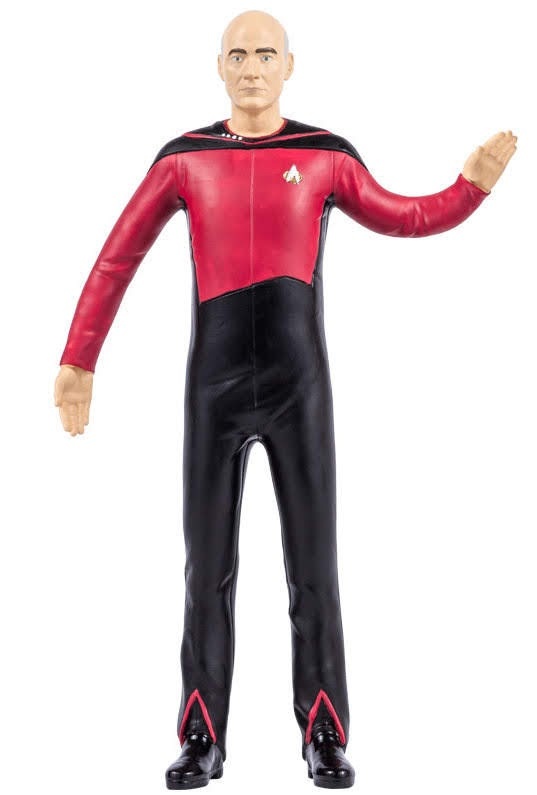 Series/format: TNG bendable action figure. 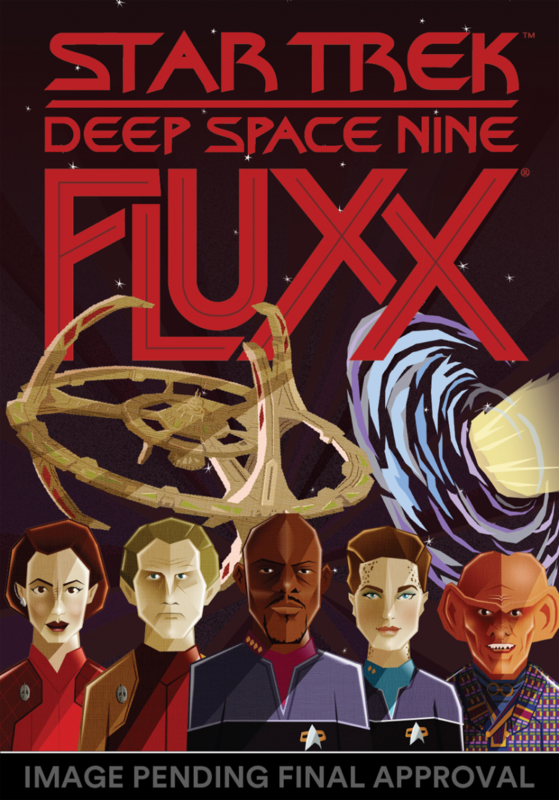 Series/format: DS9 edition of the card game Fluxx. 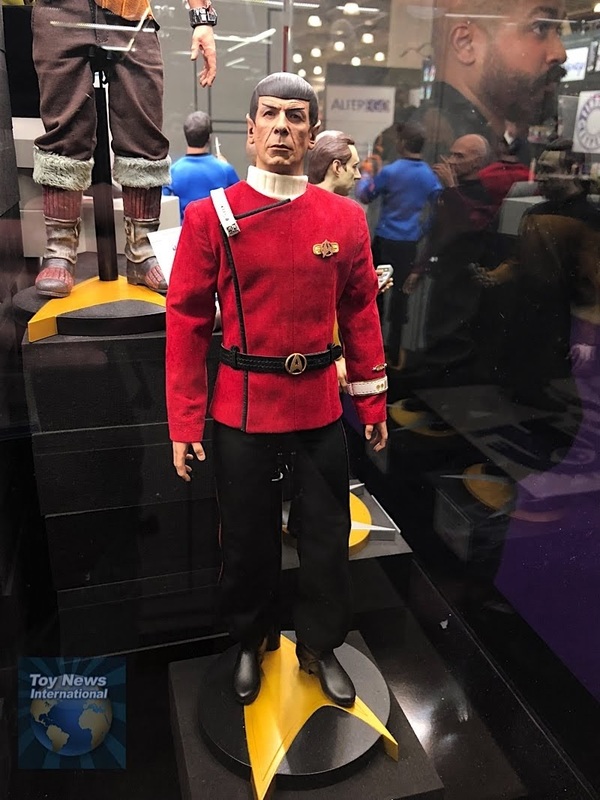 Coverage: Announcement, Toy Fair display and prototype, image, pre-order withdrawal, withdrawal details. 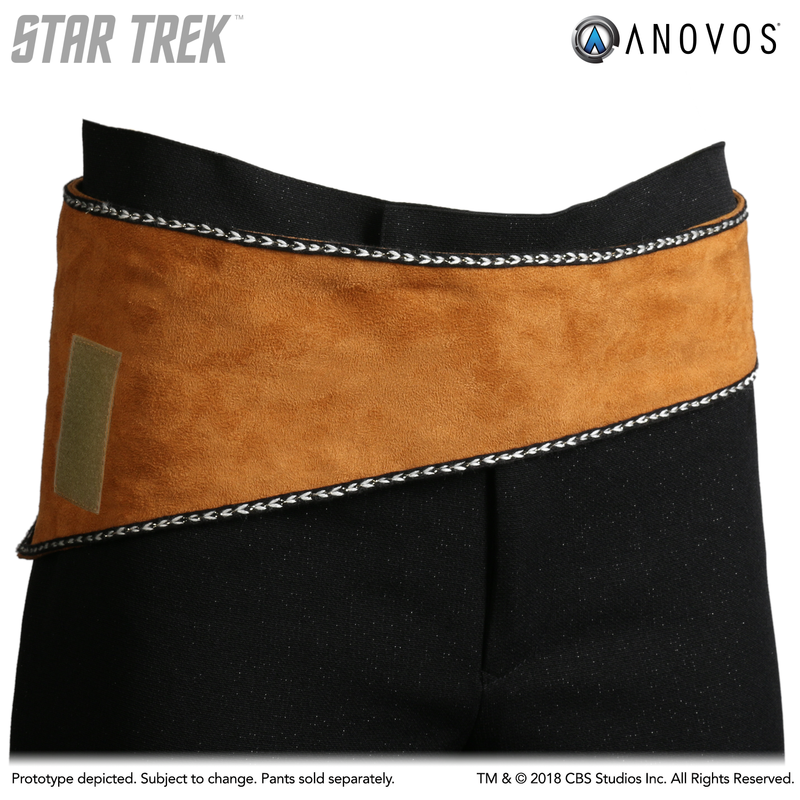 Notes: This item is currently withdrawn from pre-orders due to problems complying with gun safety laws which compromise the design. 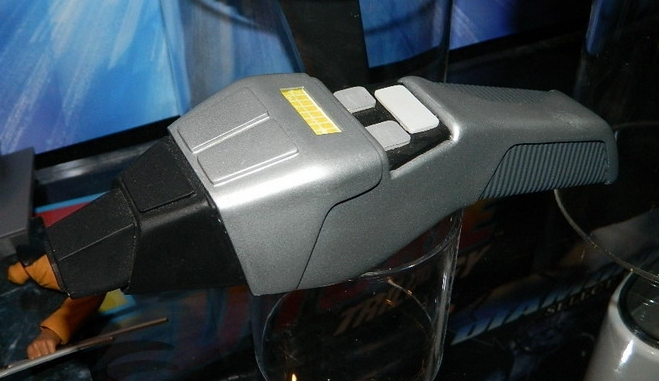 Series/format: TNG toy prop with electronic sound and light features. 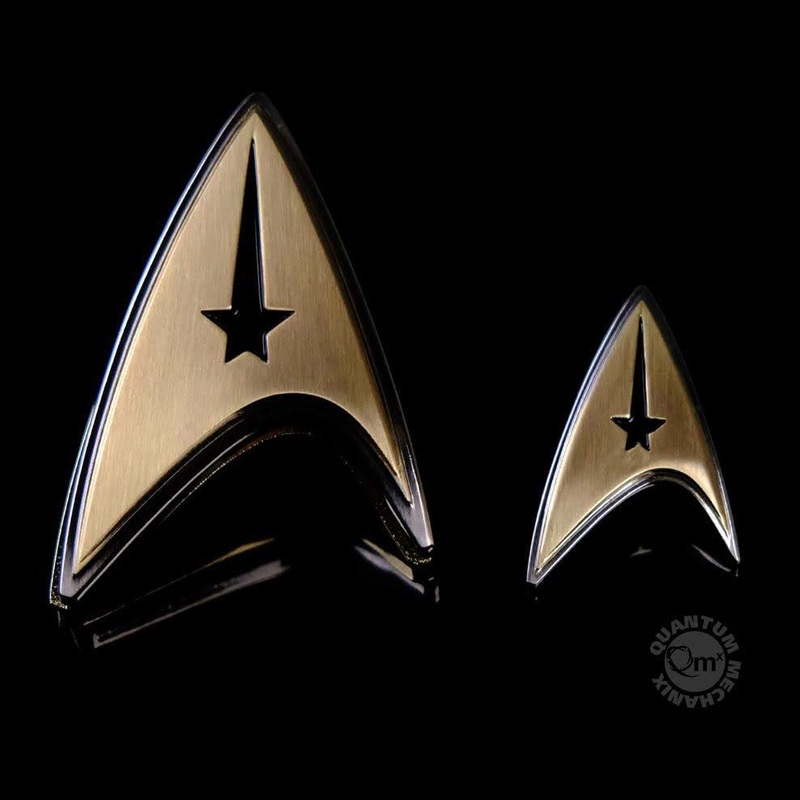 Series/format: Series of four Discovery insignia badge replicas and matching miniature pins. Series/format: Series of three mirror universe Discovery insignia badge replicas. 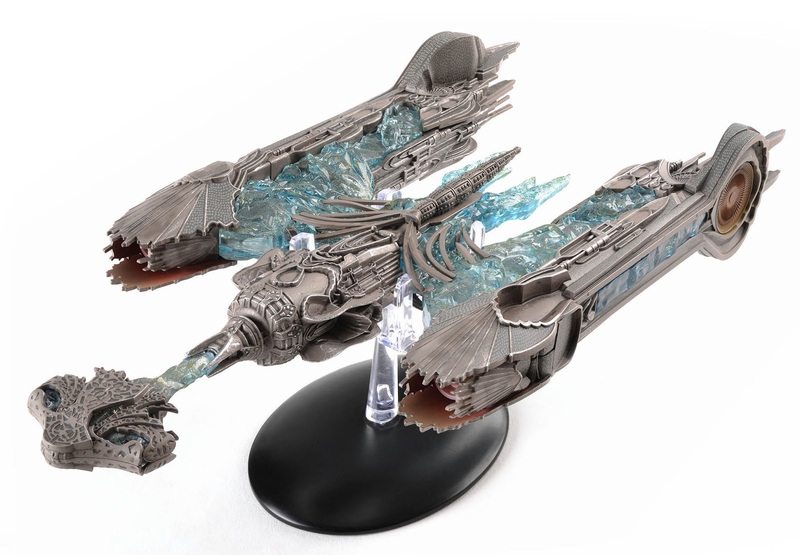 Coverage: First details, images and details. Series/format: Range of TOS costume replicas, offering in command or operations colours. 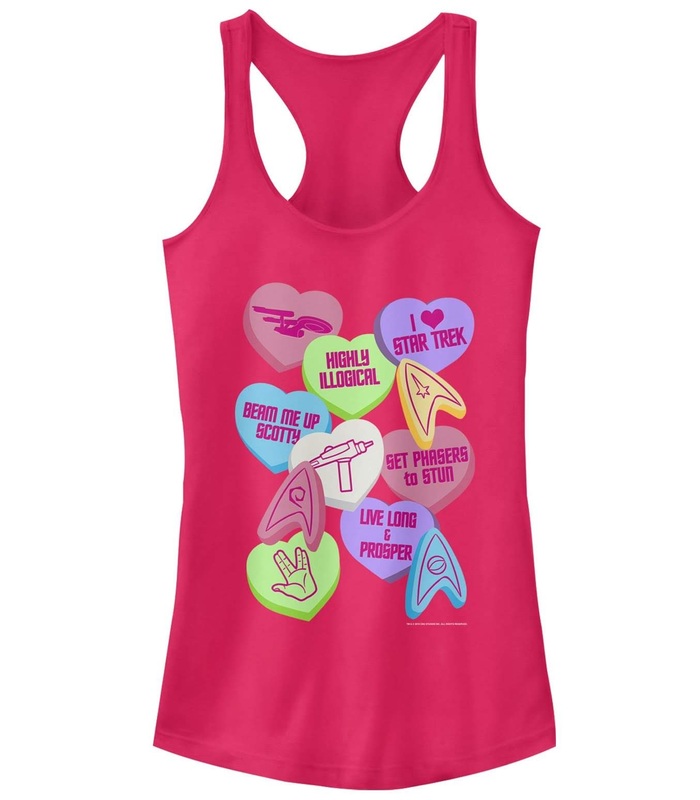 Series/format: Range of TOS TNG and Voyager Valentine's Day themed T-shirts, tank tops, and hoodies. Series/format: Pair of Discovery bookends. 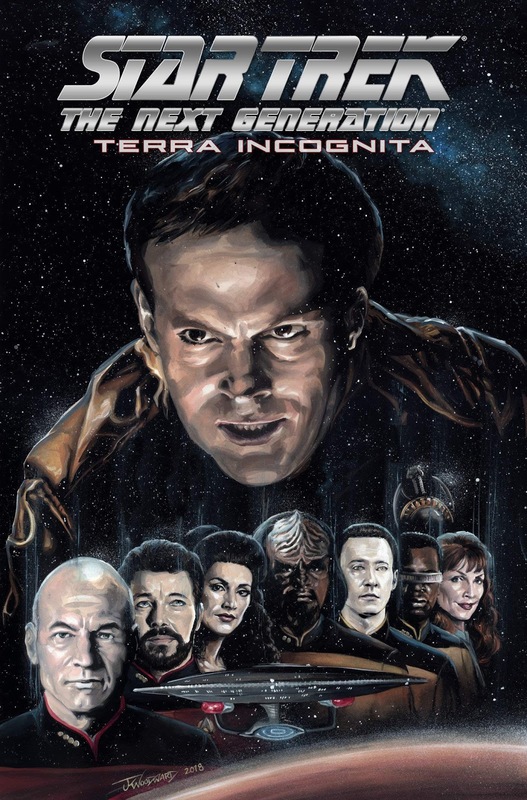 Series/format: Italian edition of the first Discovery comic miniseries omnibus. 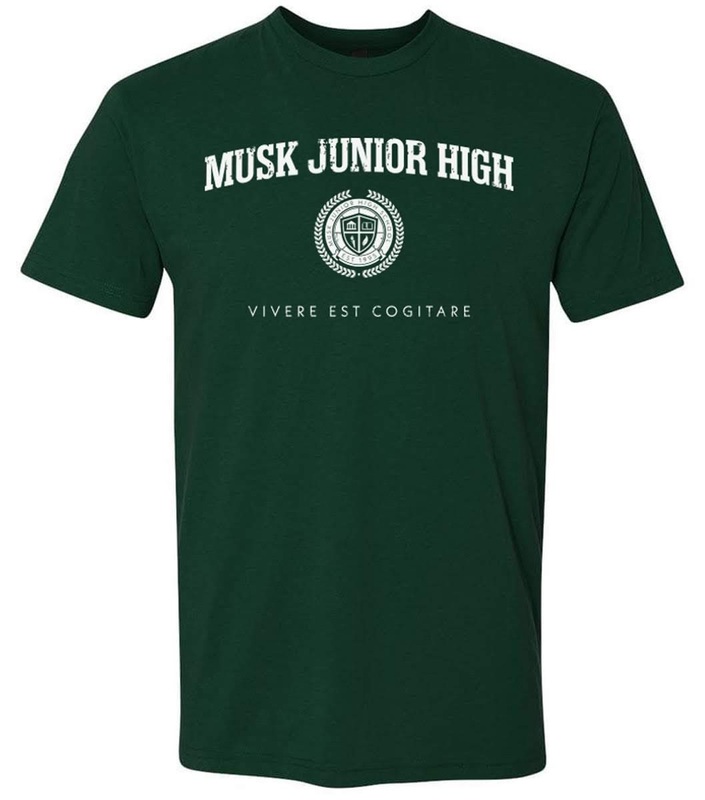 Writer: Kirsten Beyer and Mike Johnson. Artist: Tony Shasteen. Give me more books in 2019. 2018 has been slightly disapointed.